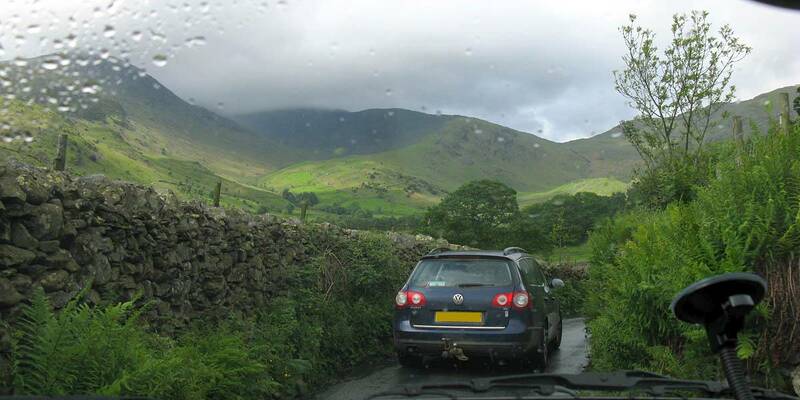 Click here to go back to Lake District 2011 Page 4. Today was the biggest drive of the trip. 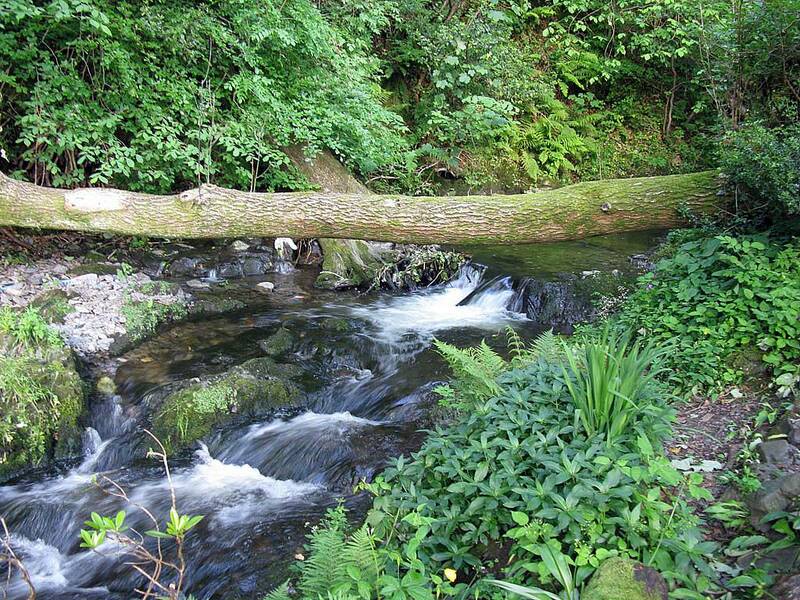 We headed up to Ambleside first, and across to Skelwith Bridge. 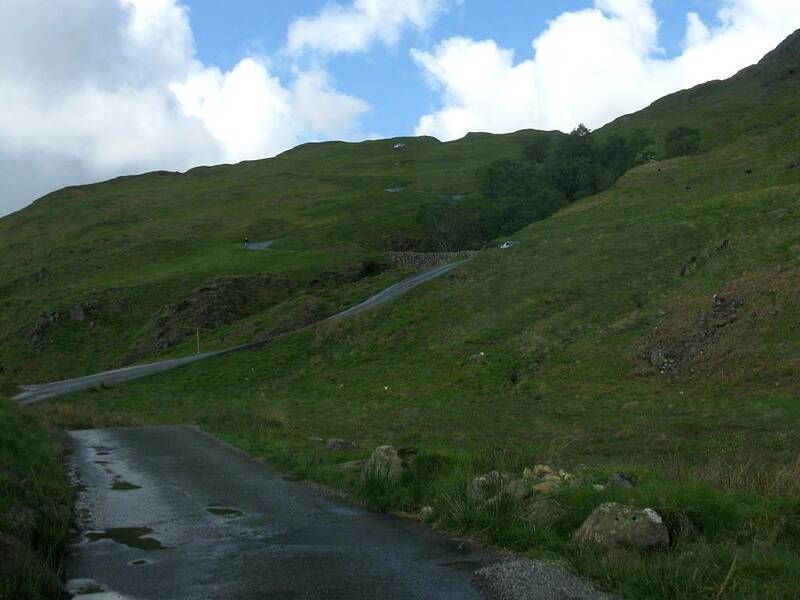 Here we turned onto some minor roads that lead to the Wynrose Pass. Progress was slow as we were stuck behind slow moving classic cars. 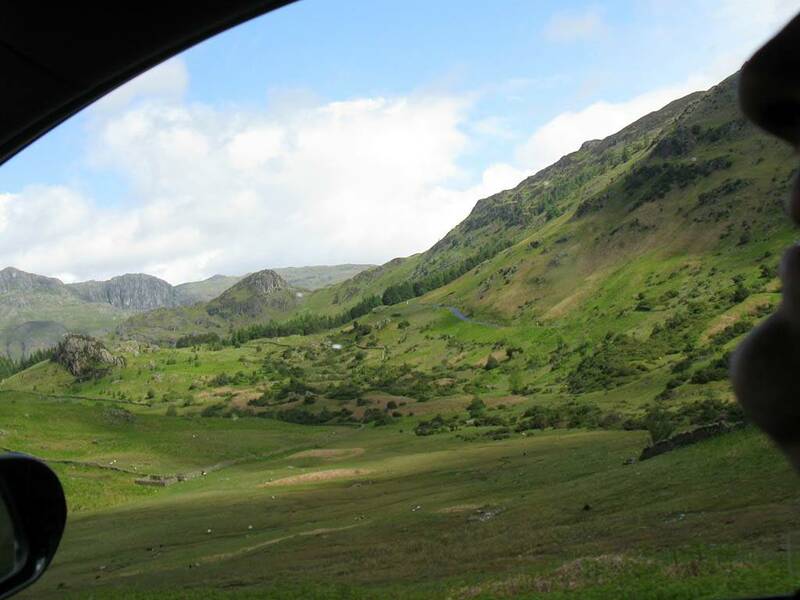 But once over the pass they pulled over and at last we were free to continue at a sensible pace. 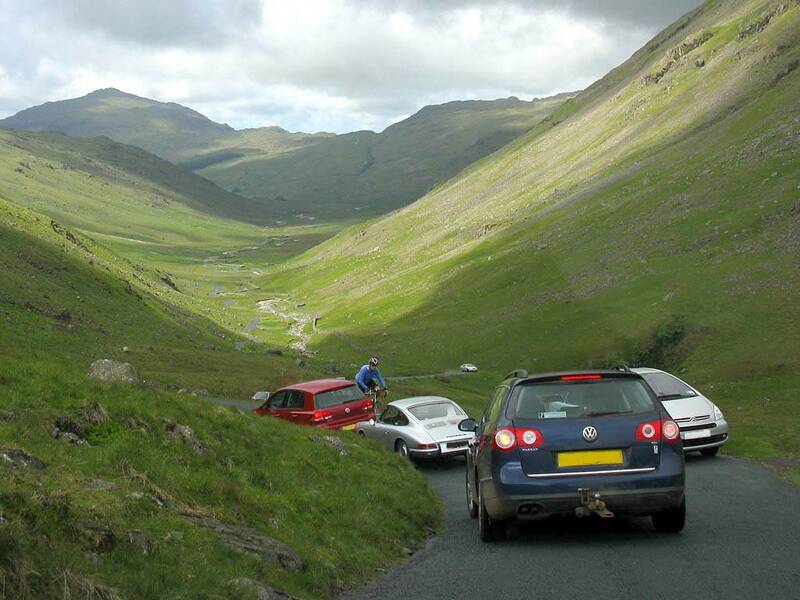 A first gear romp had me make short work of the steep, narrow and windy Hardknott Pass (so much easier in the Jazz than the old Corsa 4 years ago). 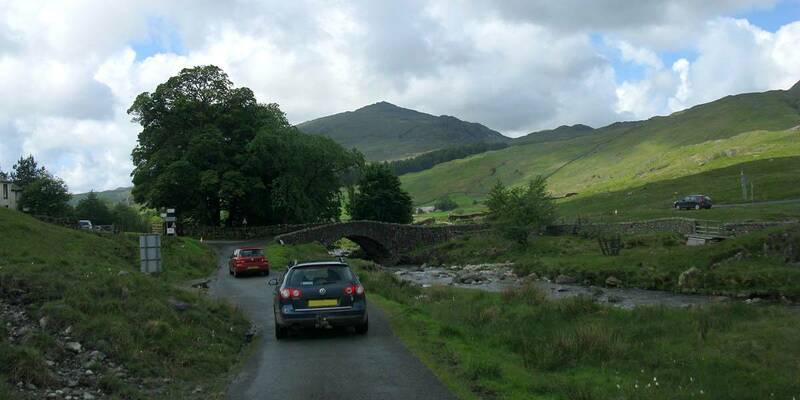 Then we followed the roads Westwards to Eskdale Green and Santon Bridge before turning northeast to Wastwater. 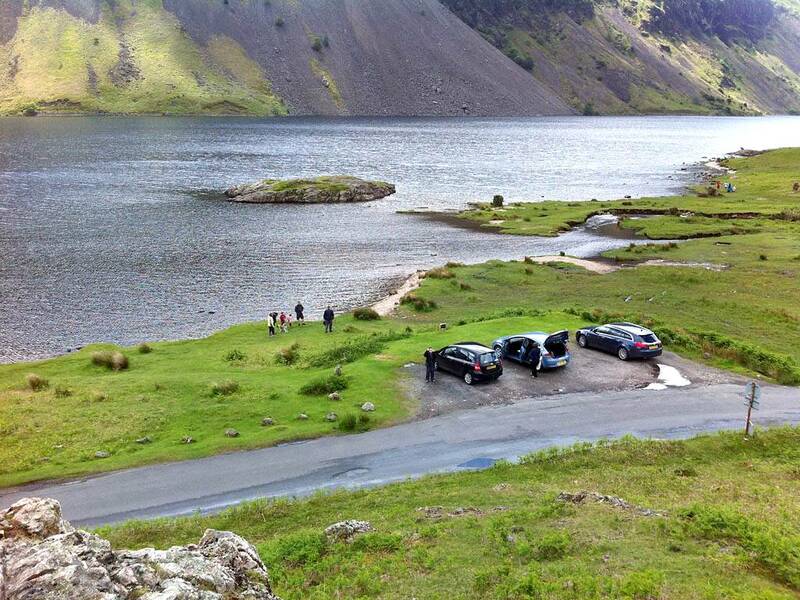 After stopping to take in the views near a road junction we carried on to Wasdale head before doubling back. 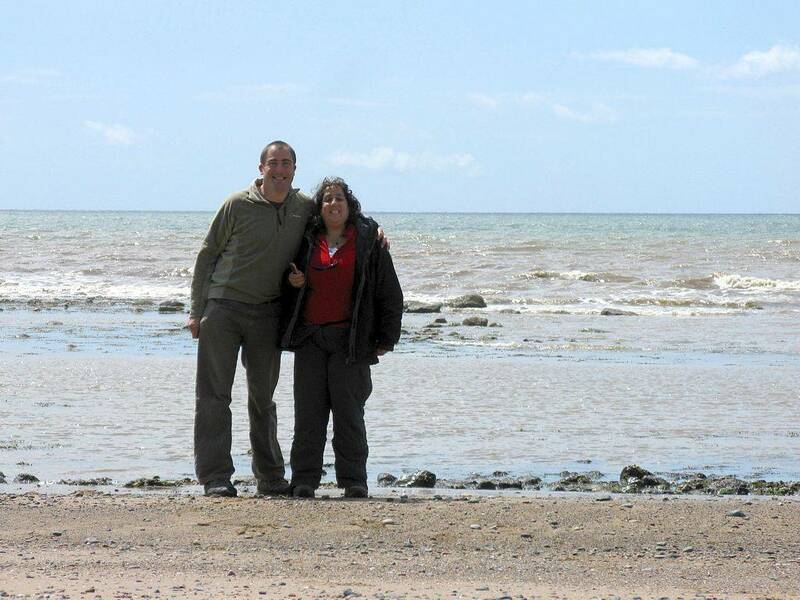 Then we made a break for the coast and stopped at Seascale where the weather was gorgeous. 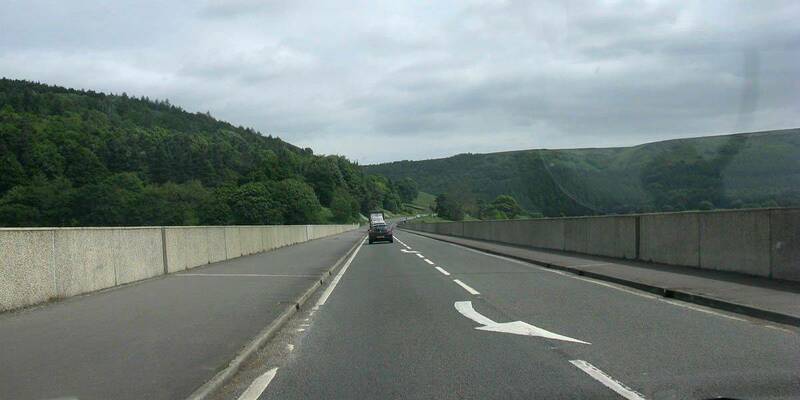 Then we headed back to the A595 and followed that southbound for a little while before turning West along a minor road that followed the river Esk upstream. 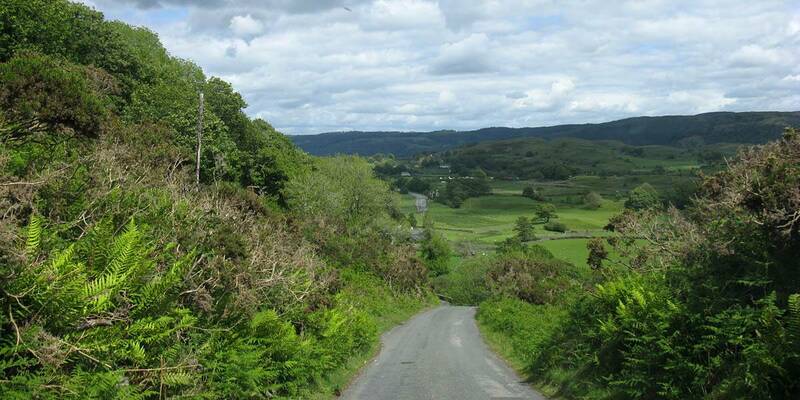 At the next junction we turned right and headed over Birker Fell to Ulpha. 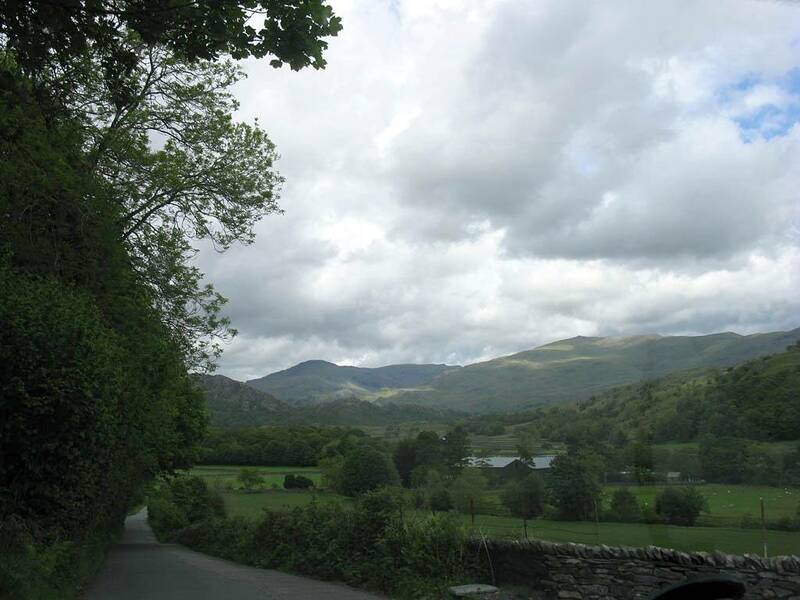 From there we carried on Southeastwards to Broughton Mills before turning Northeast and merging with the A593 to Torver and Coniston. 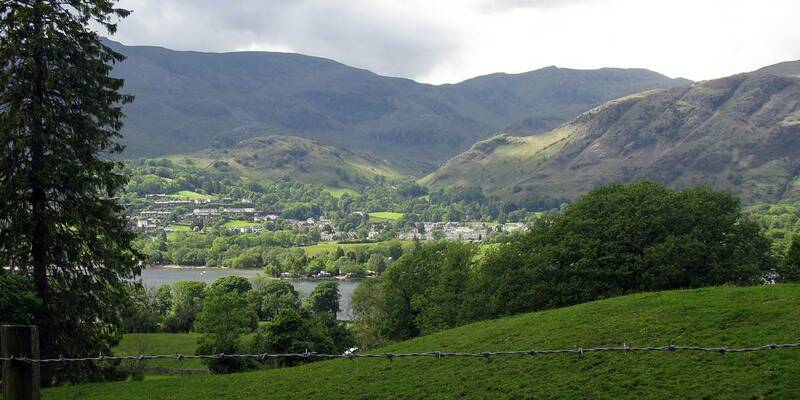 We then rounded the northern edge of Coniston Water and then followed a minor road down the Eastern bank of the lake. 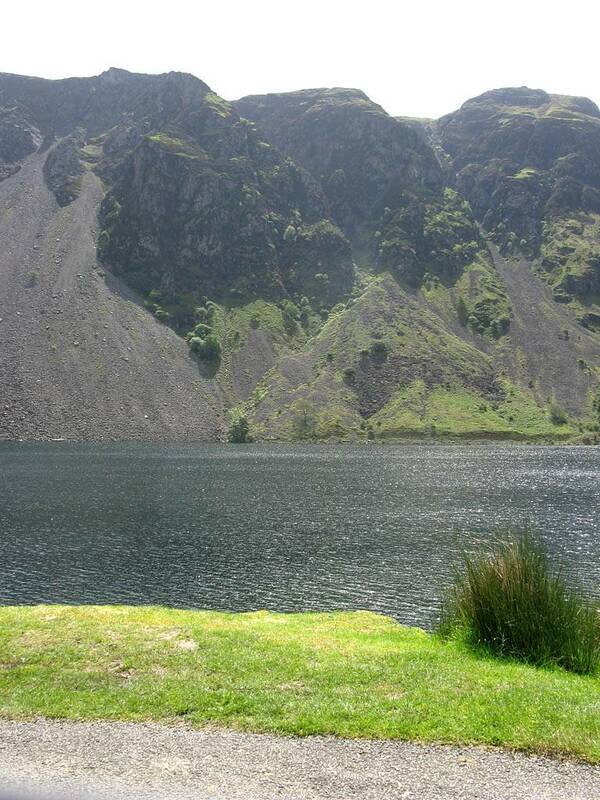 We stopped on the way to take in the view and have some nibbles. 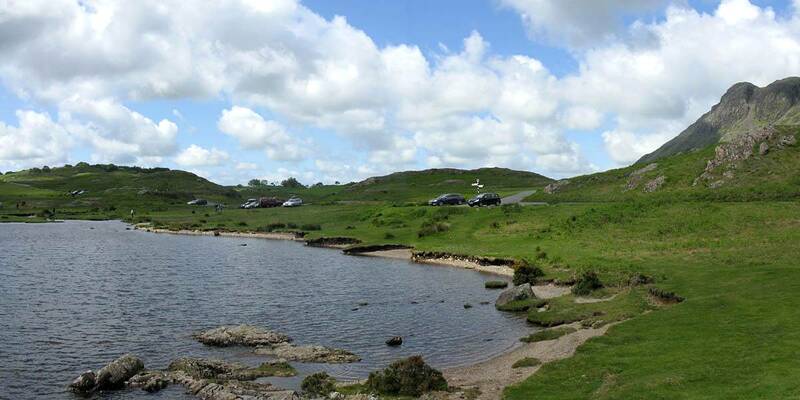 Then once round the lake and back on the A5084 we headed south and followed round to the southern tip of Windermere and back to base. On the way to the Wrynose Pass. 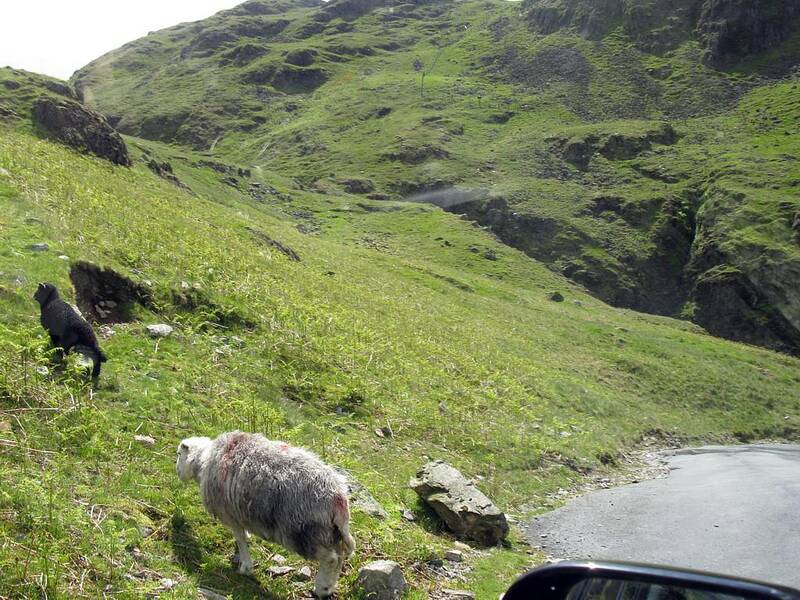 Heading over the Wrynose Pass. Phew! 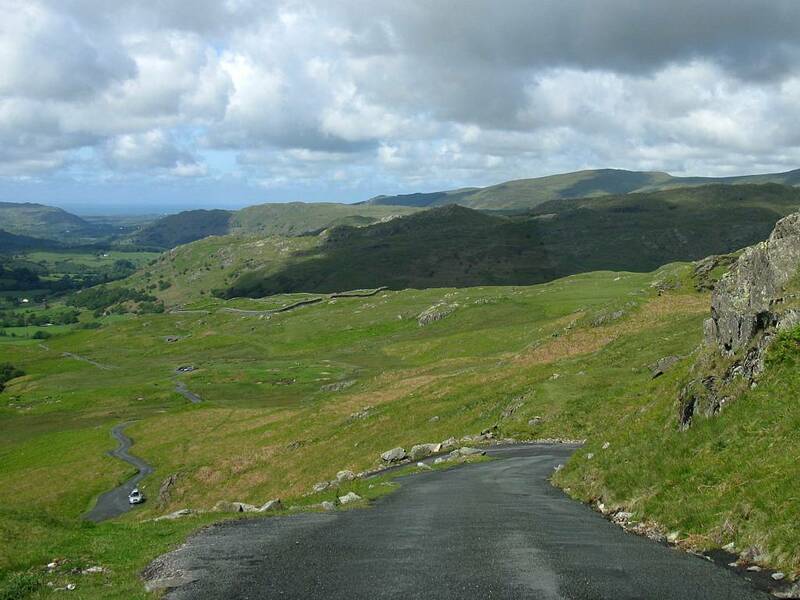 Made it to the top of Hardknott Pass. 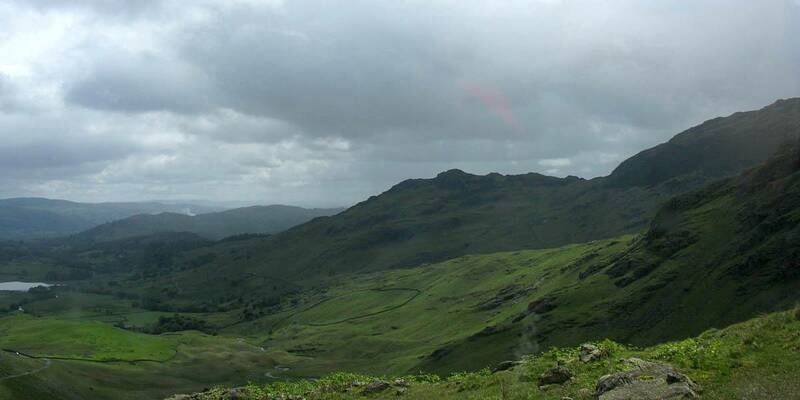 Looking West from the top of Hardknott Pass, past Hardknott Castle and towards Eskdale Green. 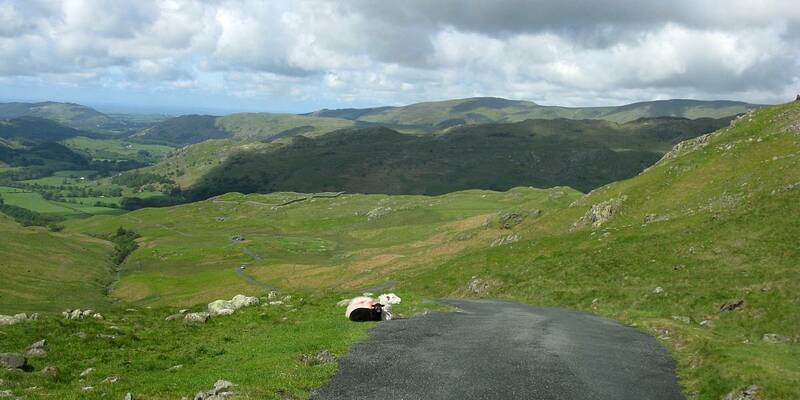 Up here the sheep own the road. 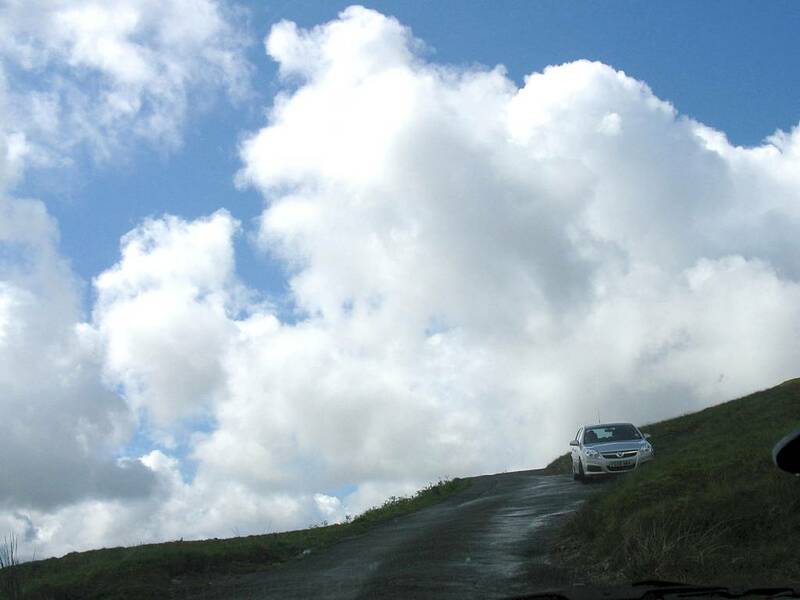 A long descent from the pass. 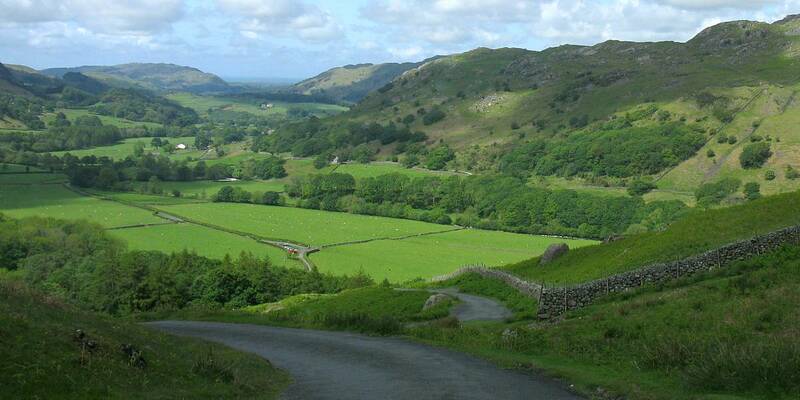 A delightful western lakes minor road. 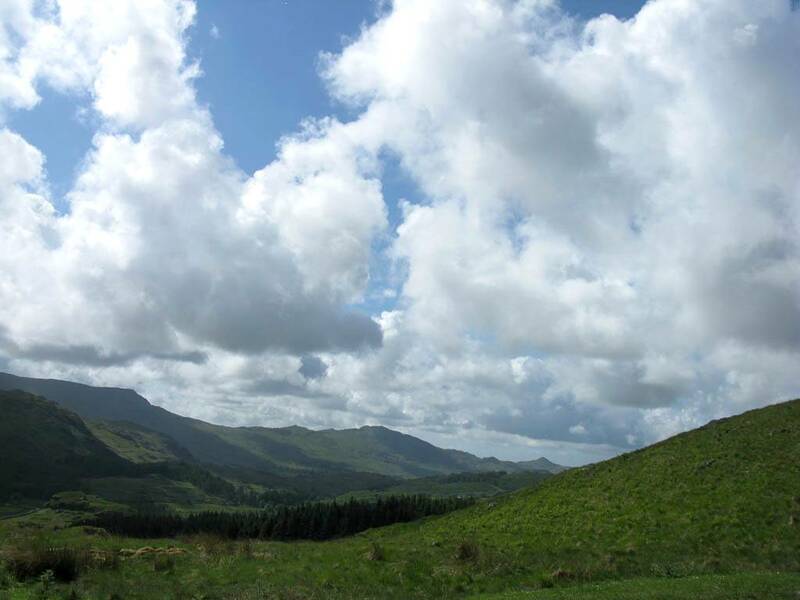 The Ravenglass and Eskdale railway near the Boot end. 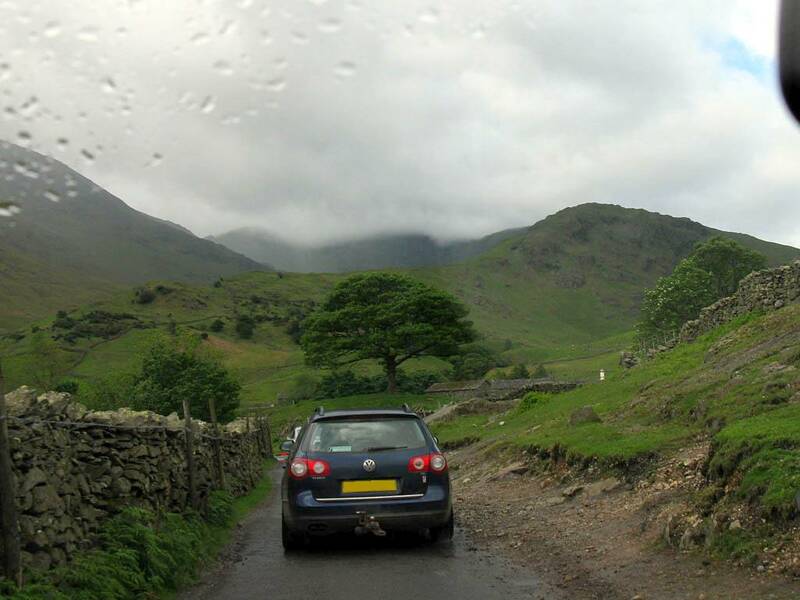 Nice view as we head up Wasdale to Wastwater. 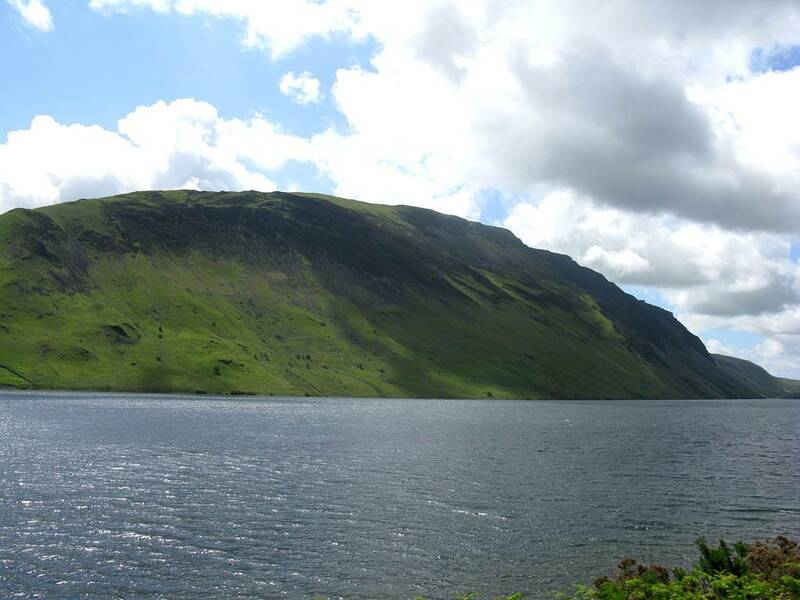 Pictures taken as we drive along the Southwestern end of Wastwater heading Northeast to a road junction a third of the way up the lake. 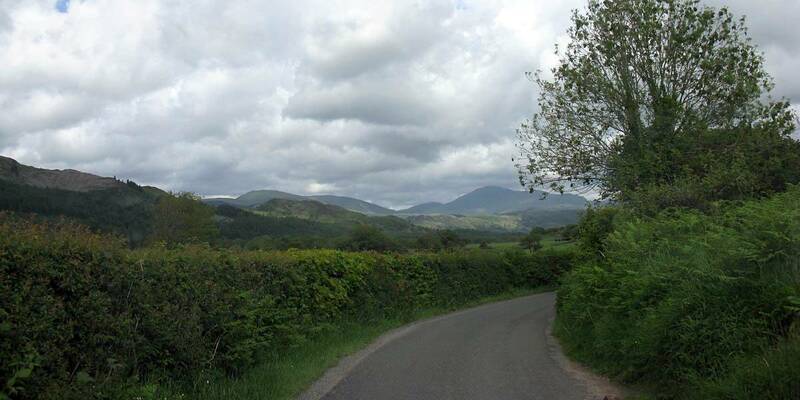 Views at the stopping point near the junction. 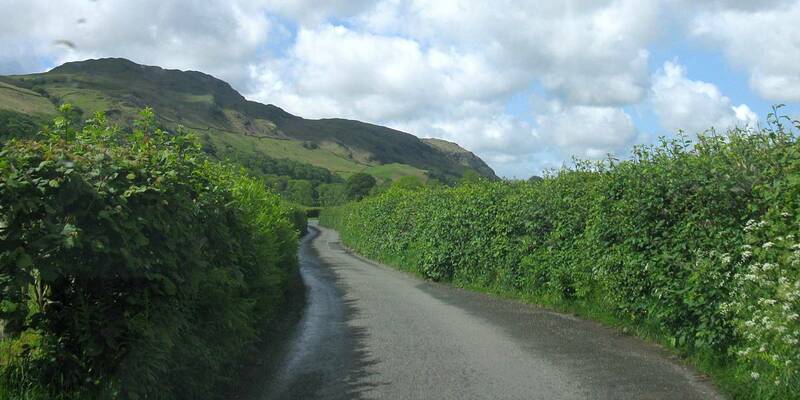 The towering cliffs opposite under IllGill Head dominate the landscape. Mike on top of a big rock taking pictures. Ren�e by the car taking the last picture. Two iPhone panoramas from on the rock. The second is a Photosynth 360 degree panorama. 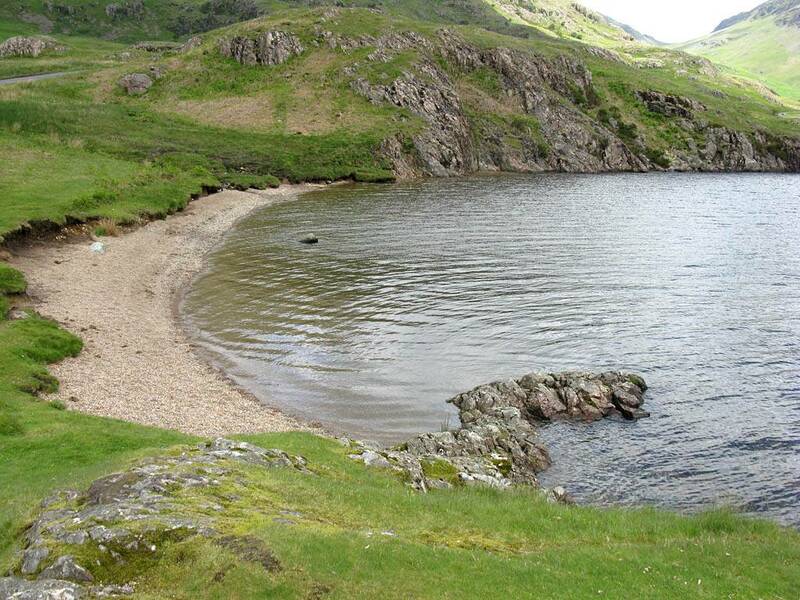 At the water's edge. 360 degree panorama taken from a little peninsula sticking out into the lake. Looking back to the car from the peninsula. 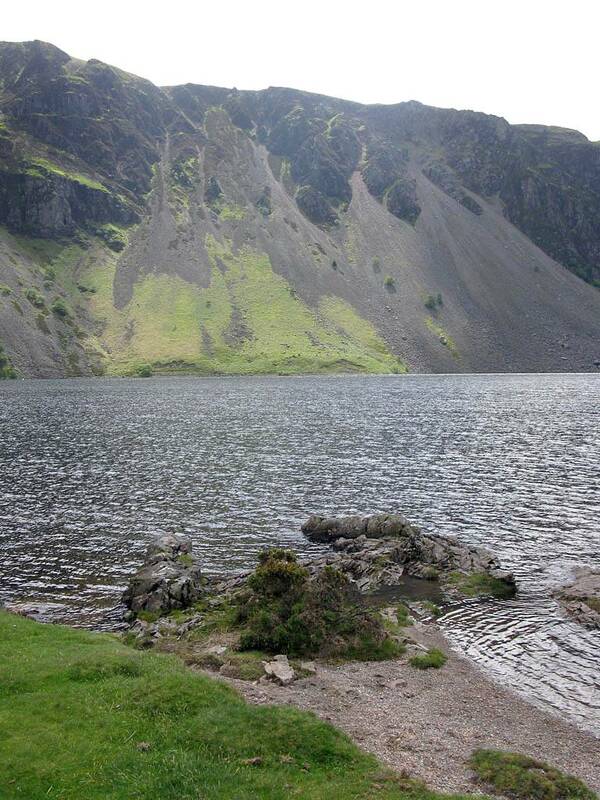 More views of Wastwater before we get back in the car. 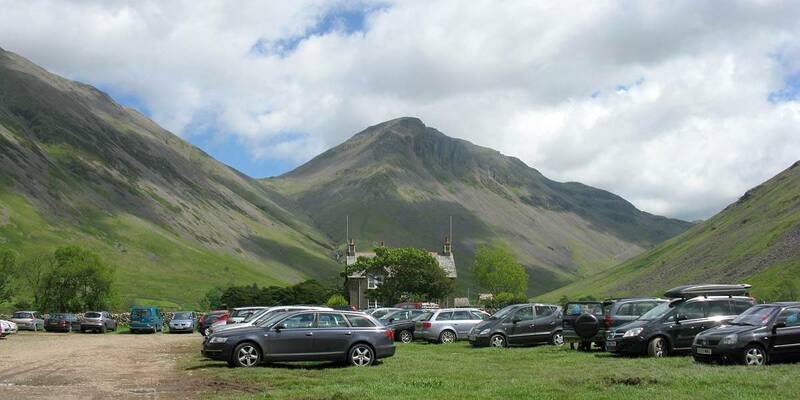 Wasdale Head. 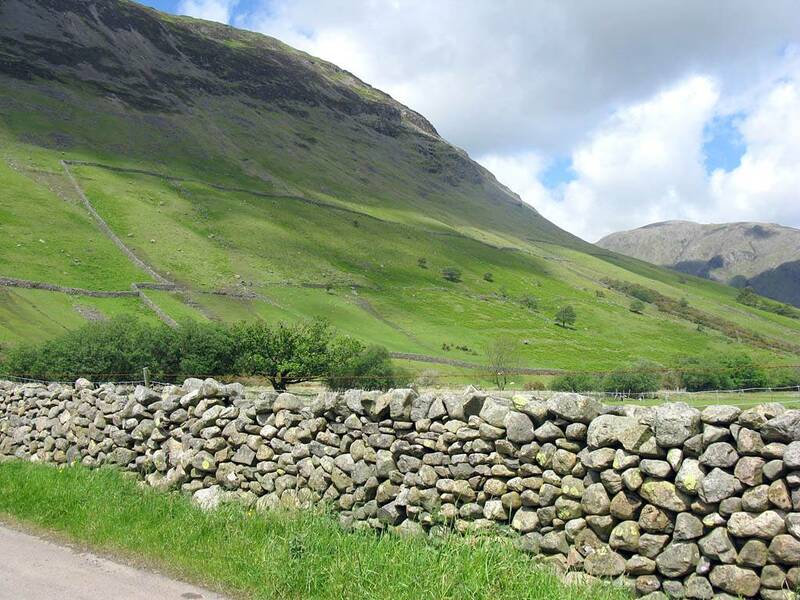 Wasdale Head. 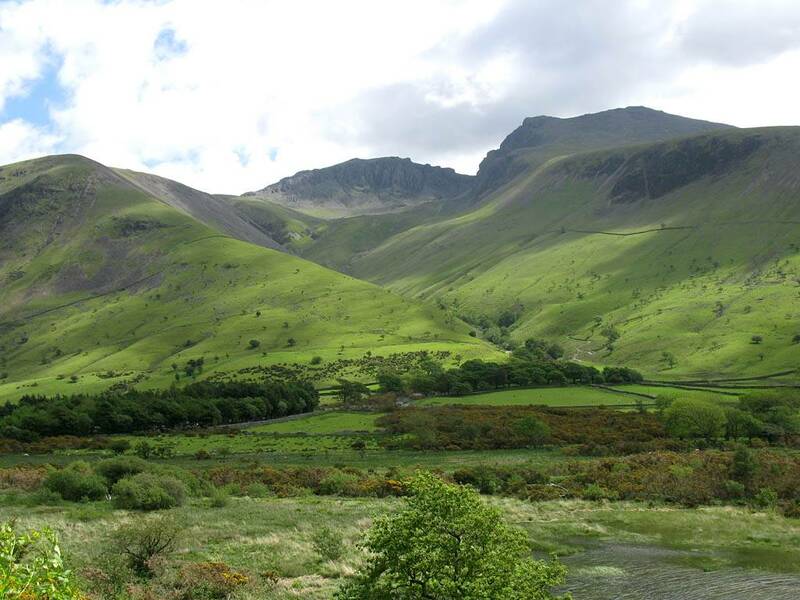 Looking Eastwards towards the fells that surround Scafell Pike. 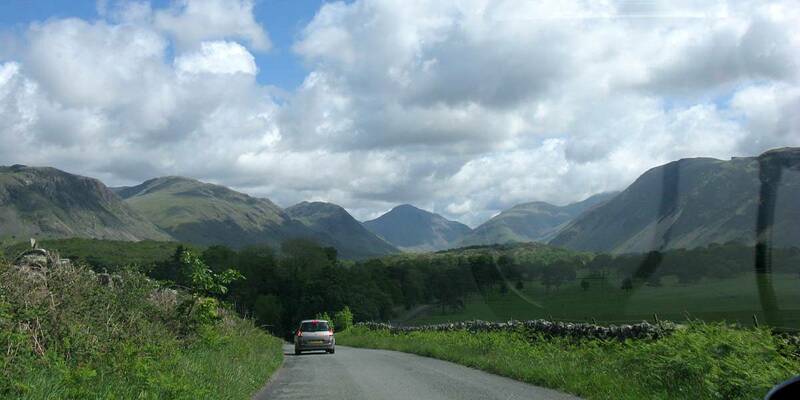 Heading Southwest from Wasdale Head. 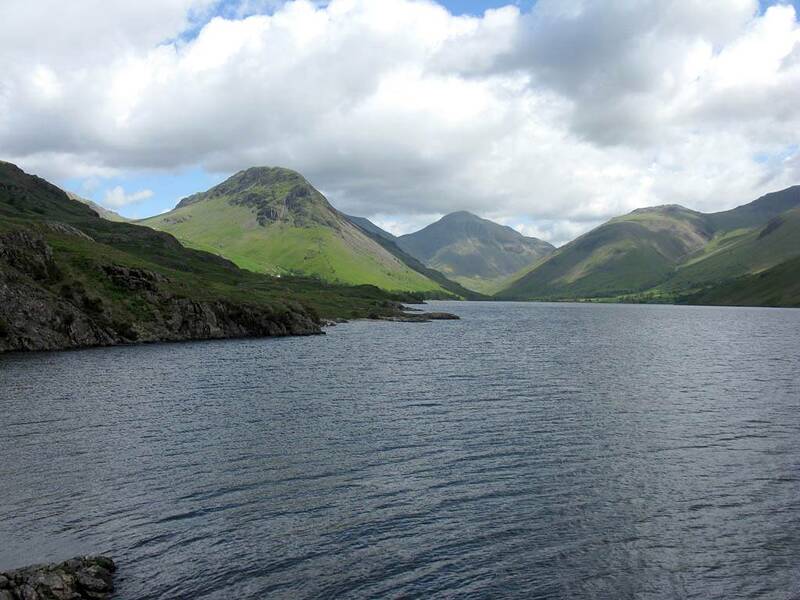 Looking up to Scafell Pike itself from the northern tip of Wastwater. 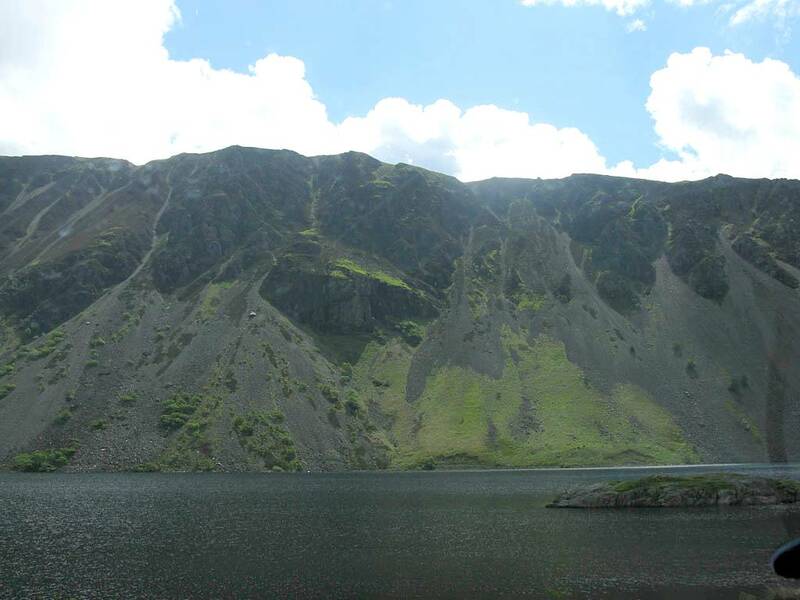 Panorama of the northern end of Wastwater. 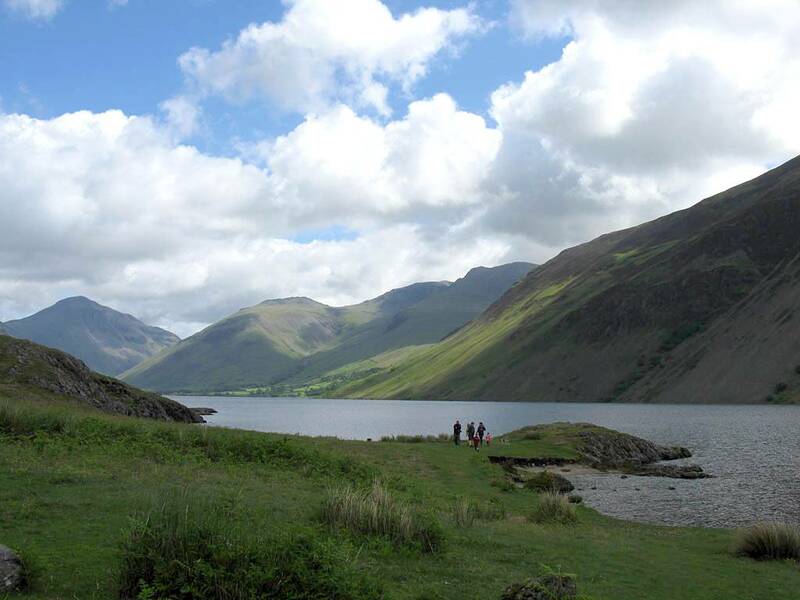 Heading Southwest back along Wastwater before making a break for the coast. 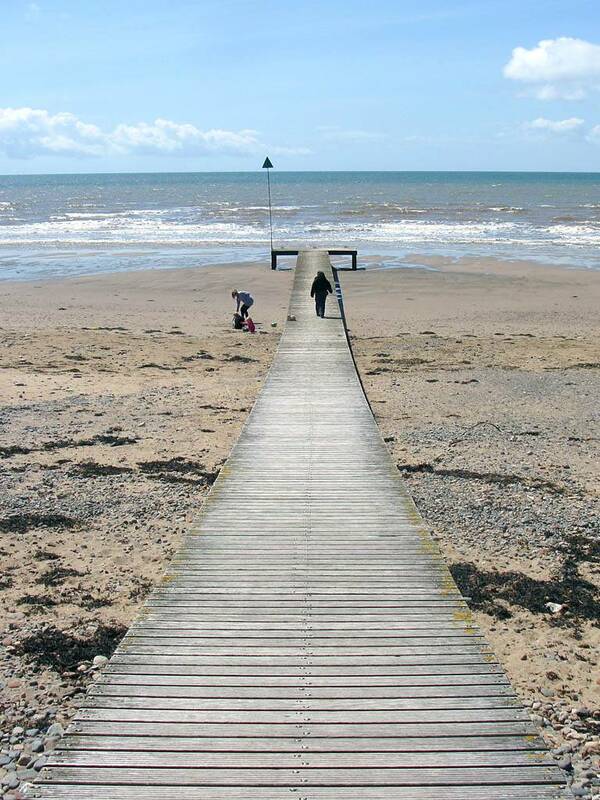 A 360 degree panorama from the Seascale promenade by the car park. 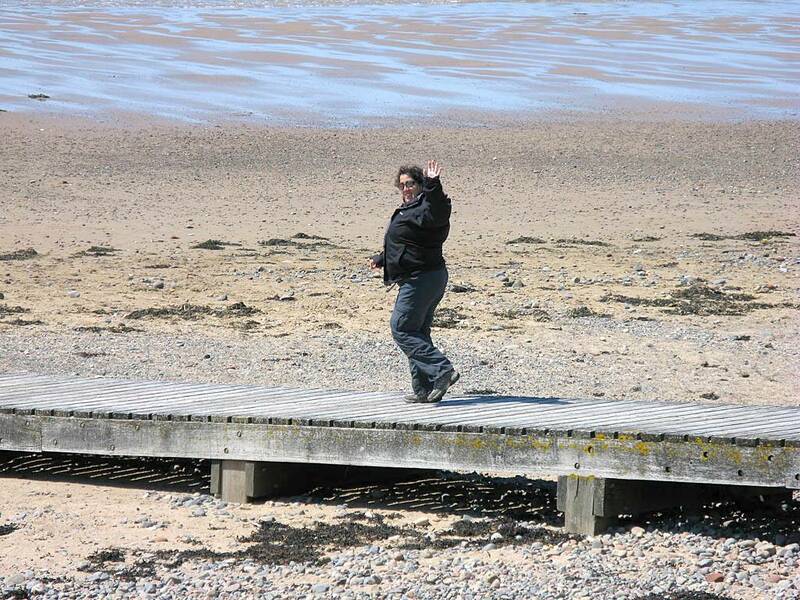 Walking along a small pier. The end is landlocked as it's low tide. 360 degree panorama from the end of the pier. Out to sea the Isle of Man is visible in the distance. 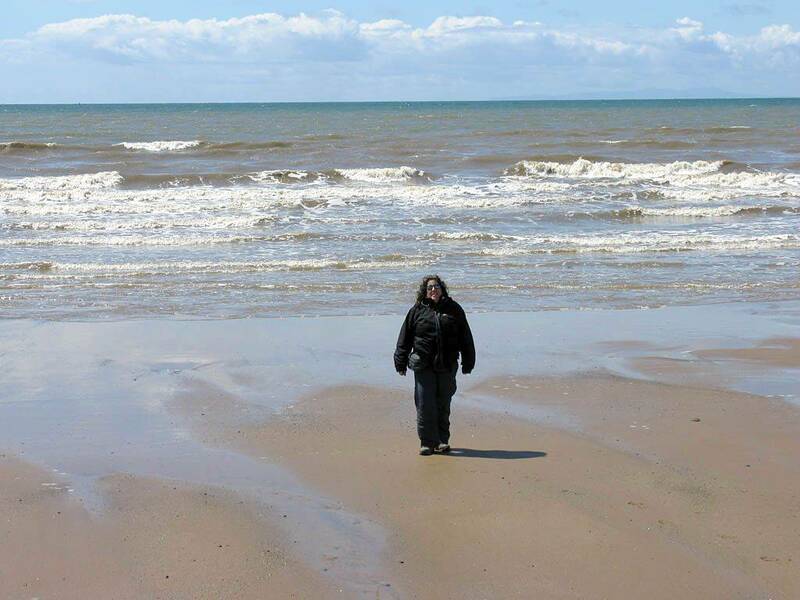 Ren�e soaking in and enjoying the sun sea and sand. 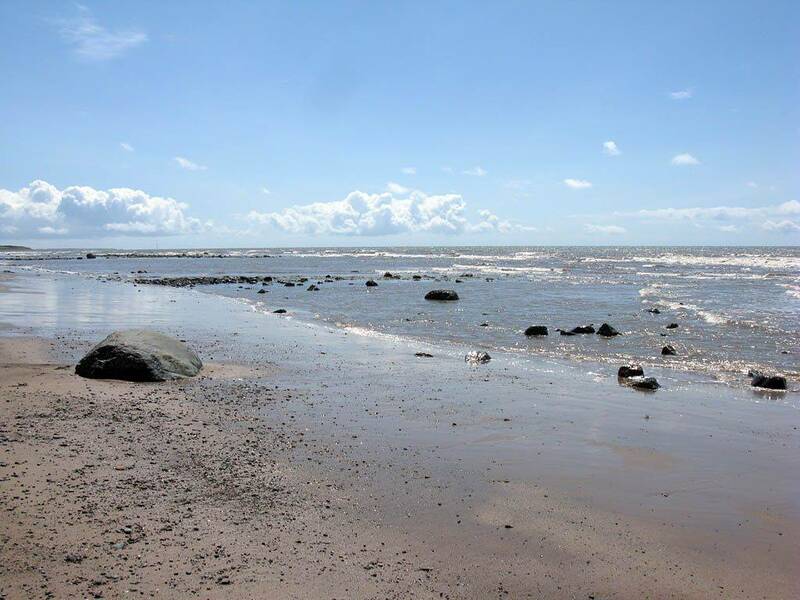 Looking Southwards along the coast. Ren�e and Mike posing with the camera resting on a rock on a delay timer. 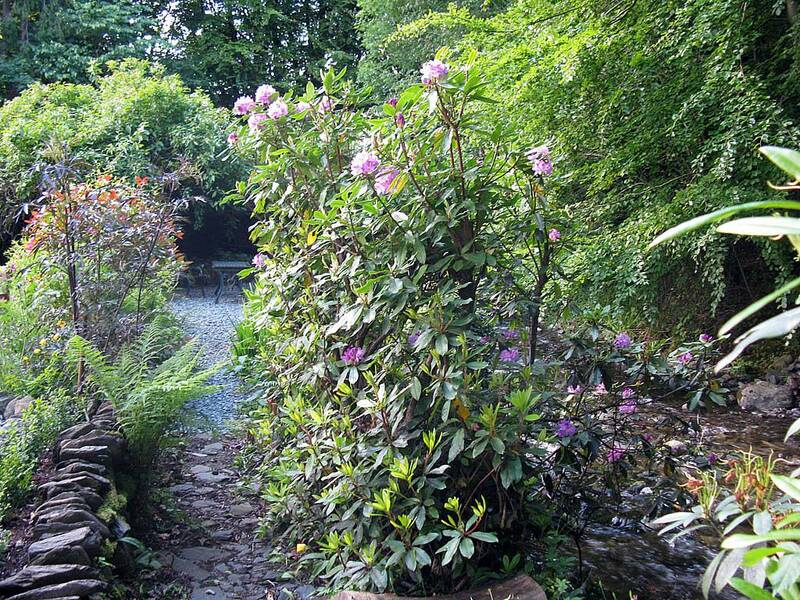 Heading upstream alongside the river Esk. Pausing before heading South to Ulpha. 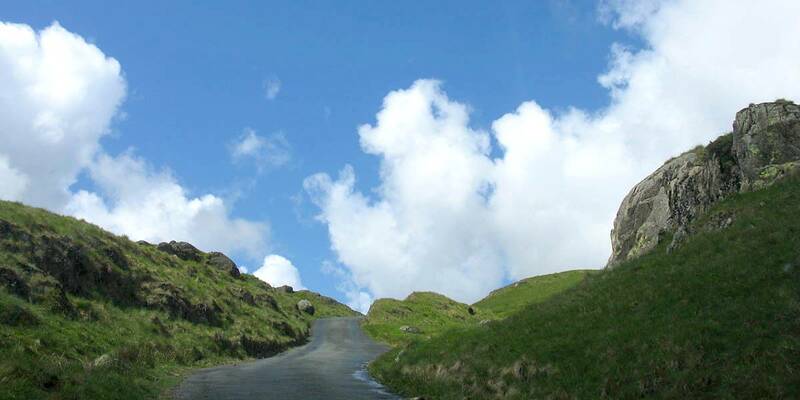 Ahead the road climbs up onto Birker Fell. 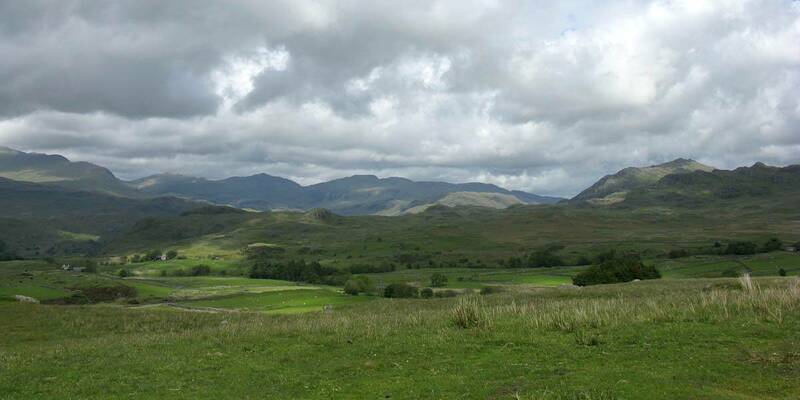 Views on top of Birker Fell. 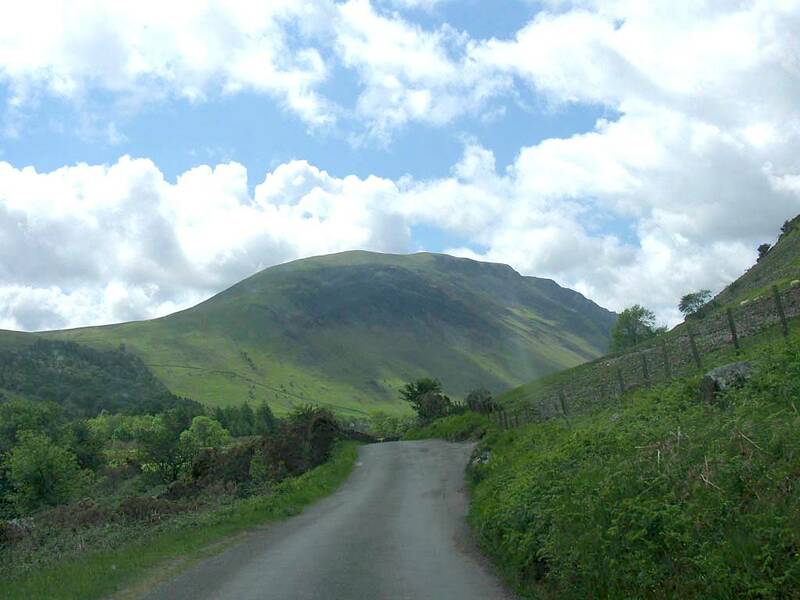 The summit to the right of the road is called 'The Seat'. 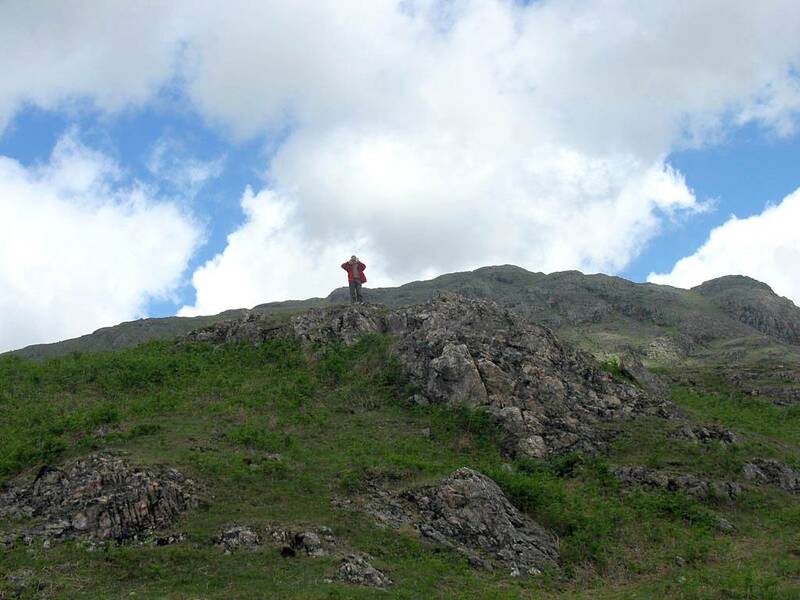 Carrying on towards Coniston. Arr! 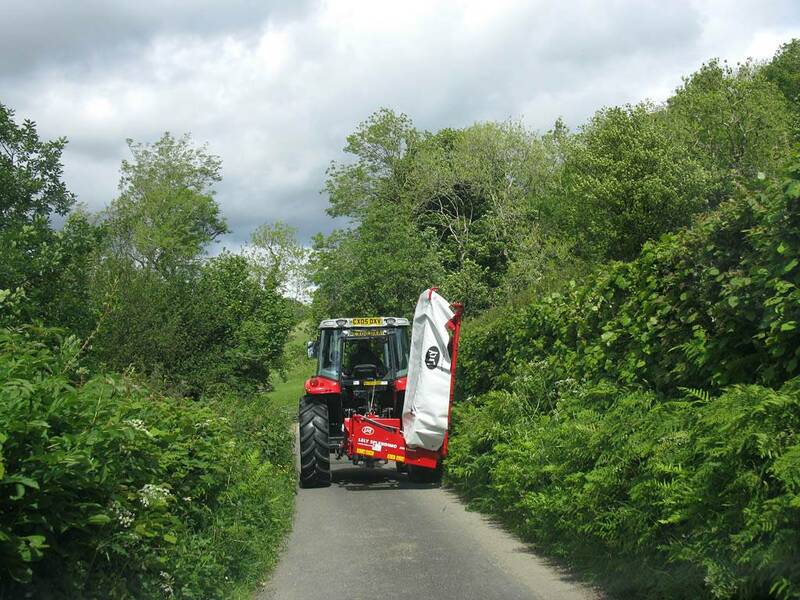 No way past this tractor. 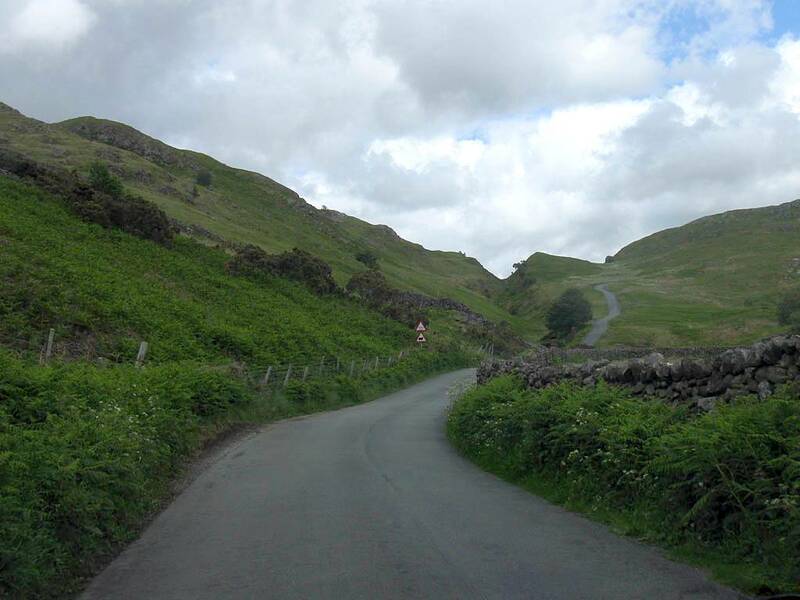 Thankfully he let us past eventually and soon the A593 to Torver loomed way below us. 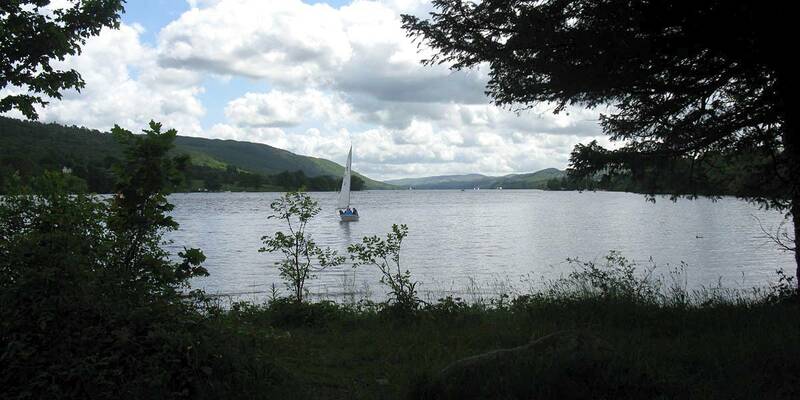 The northern tip of Coniston Water. 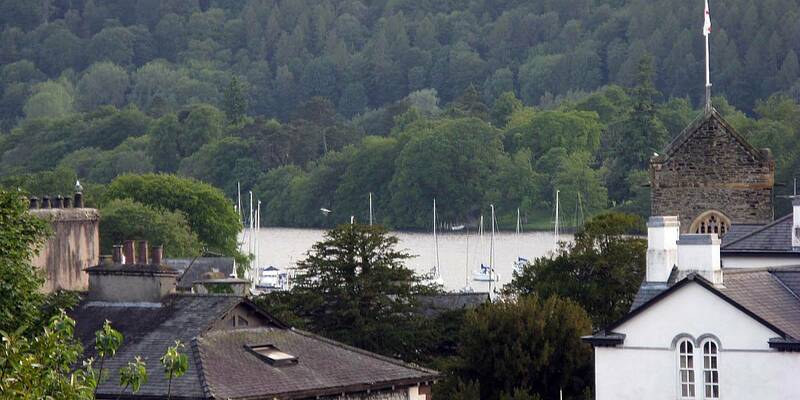 Coniston from across the lake. 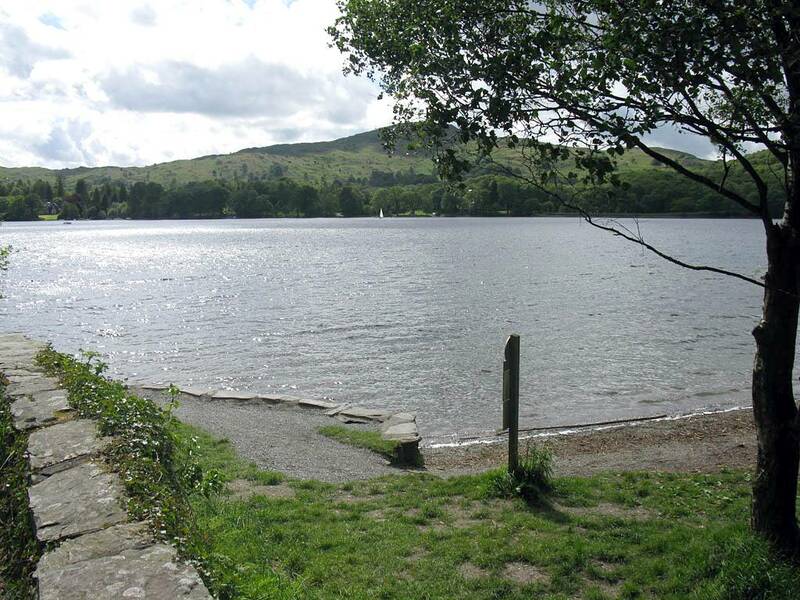 Stopping for a break at a nice spot on the Eastern bank of Coniston Water. 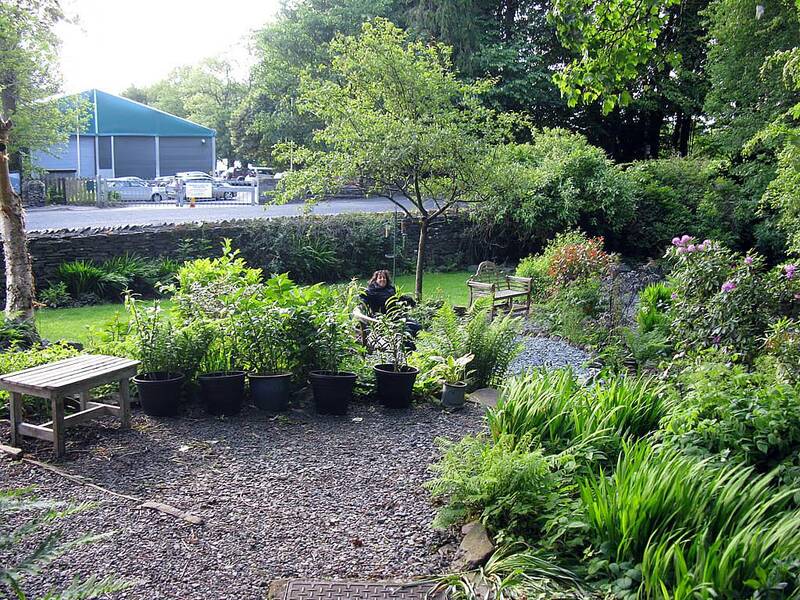 BnB Garden. 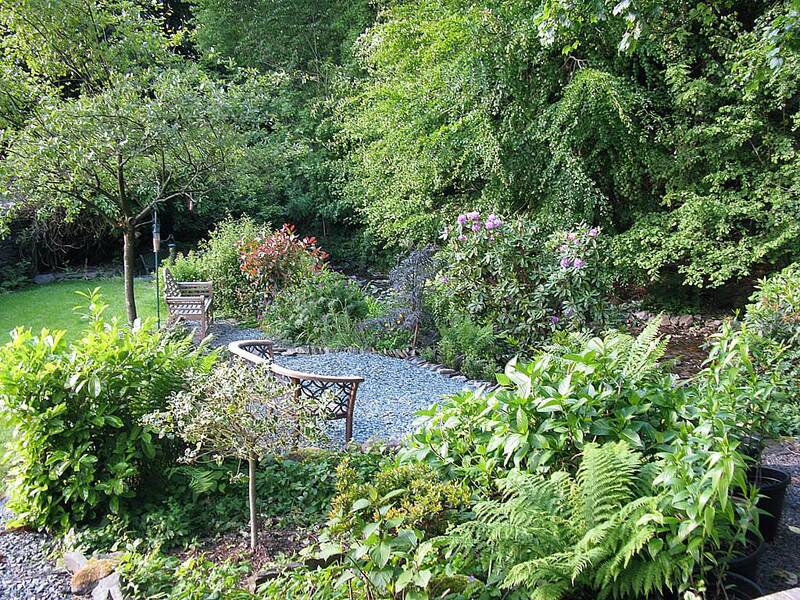 After we returned to Bowness we relaxed for a while at the BnB before supper. 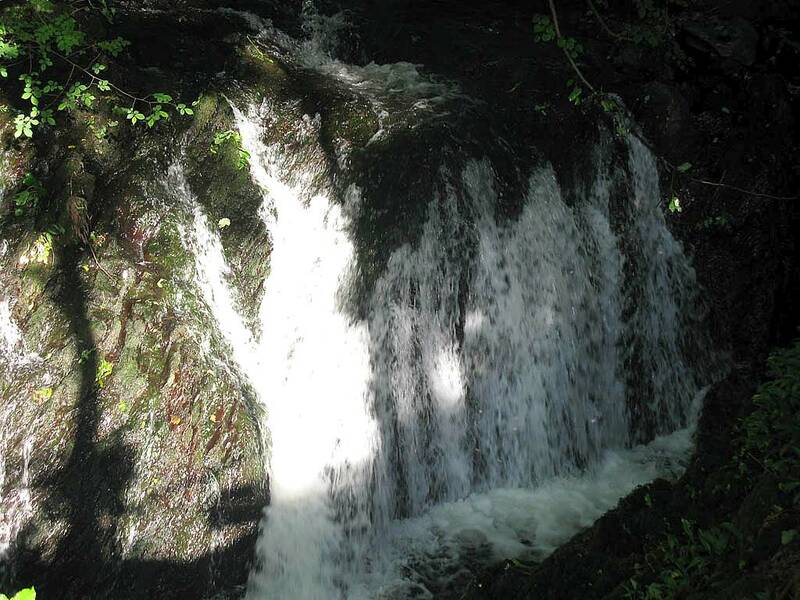 The waterfall with sunshine shining on it. 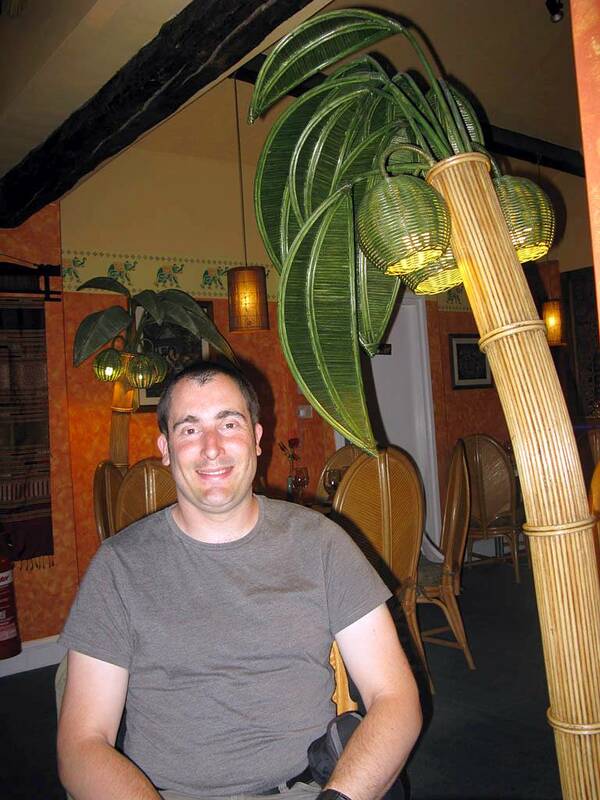 Ren�e relaxing in the BnB garden. 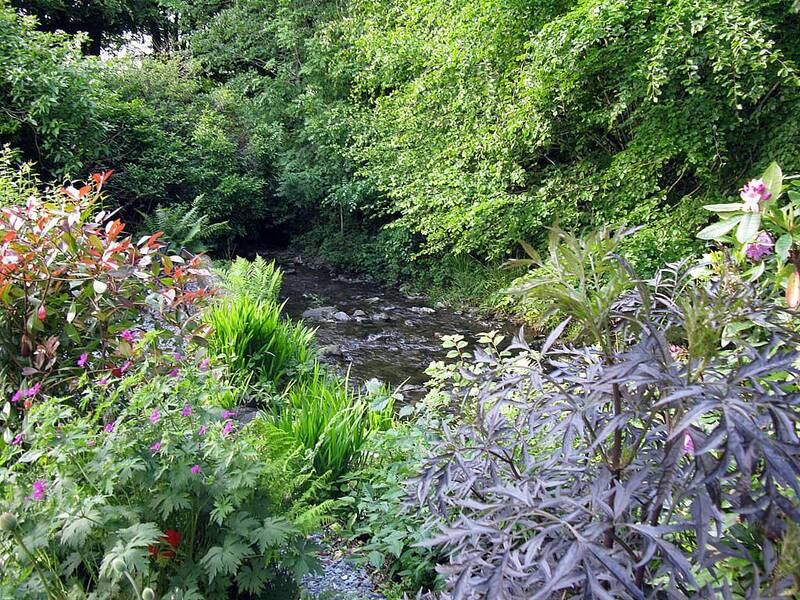 Views of the BnB garden and the river flowing through it. 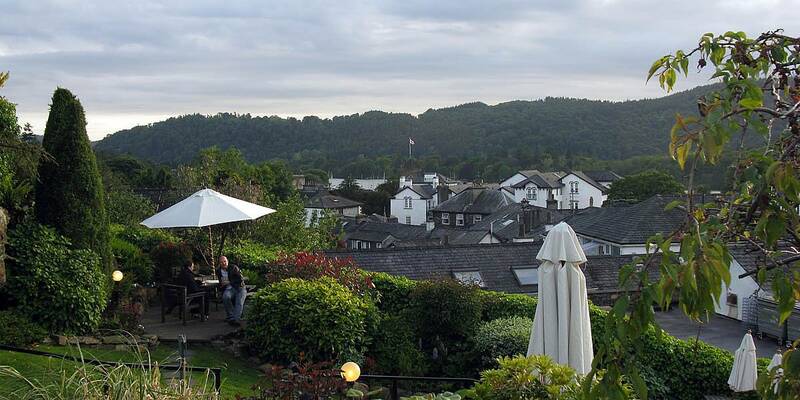 Last Evening In Bowness. 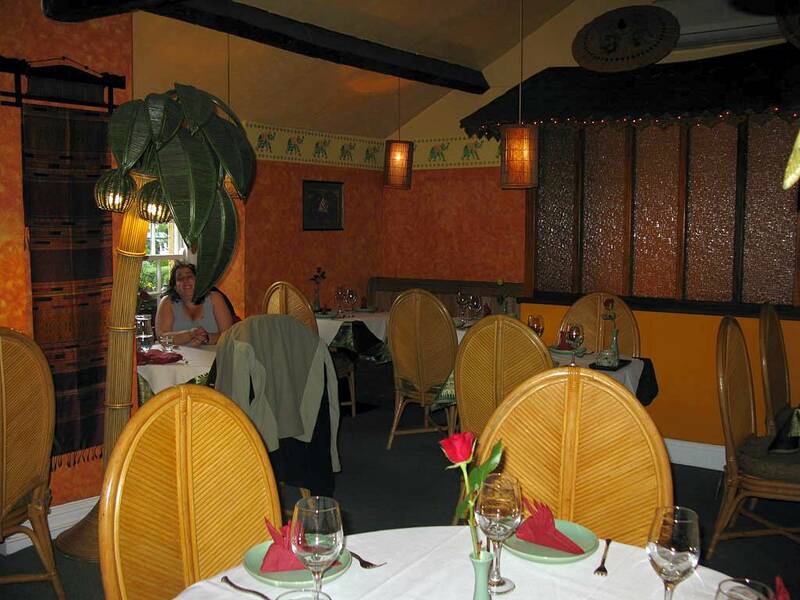 We went to a nice Thai restaurant in Bowness. The decorations inside were very pretty. Then a walk up to The Angel Inn pub on a hill to look at the view before returning back to the BnB to retire one last time. 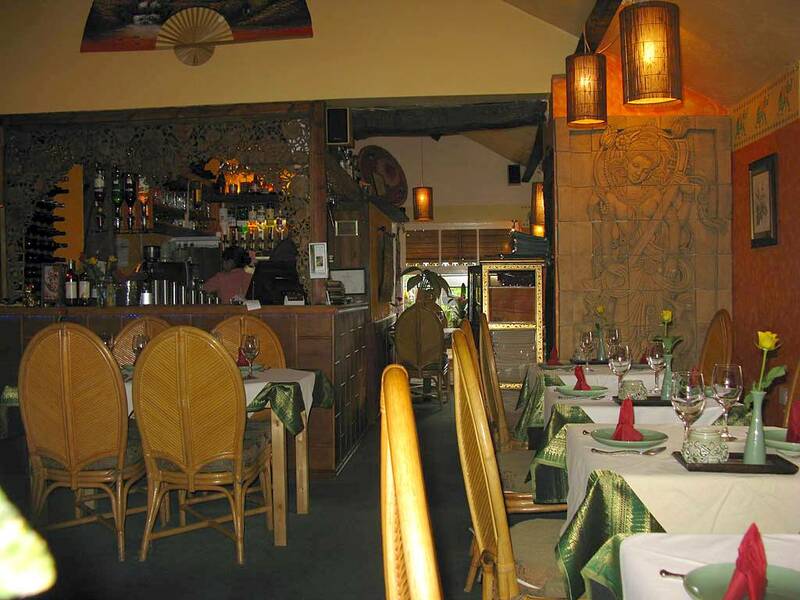 The Thai restaurant. 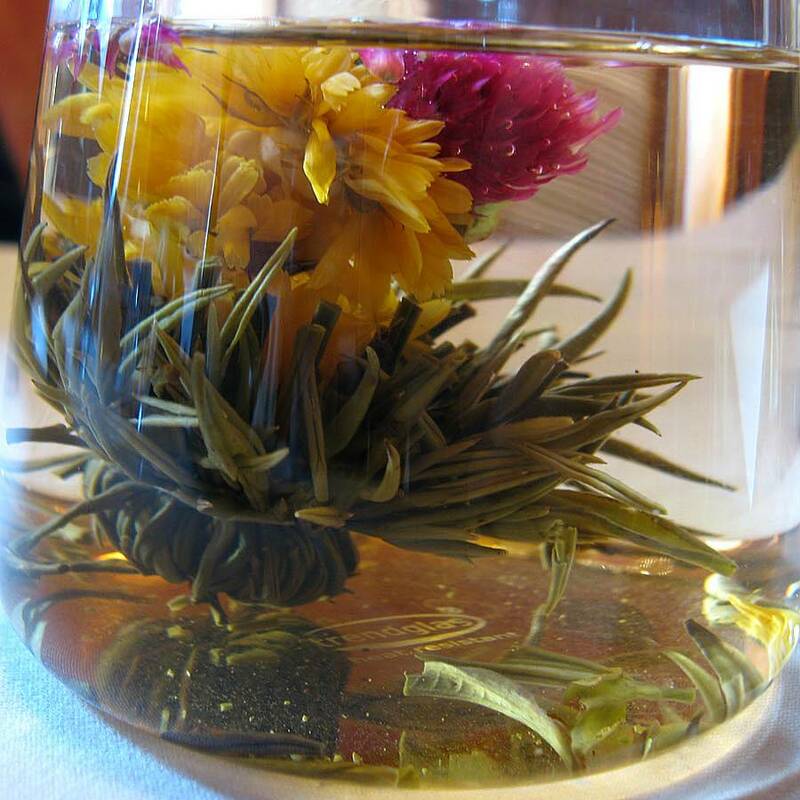 A bloom tea that turns into a flower as it brews. 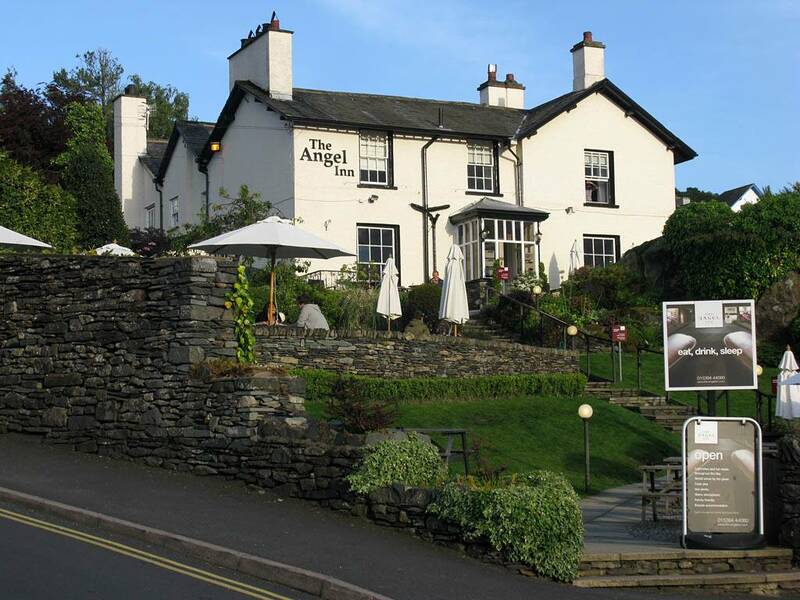 The angel Inn pub. 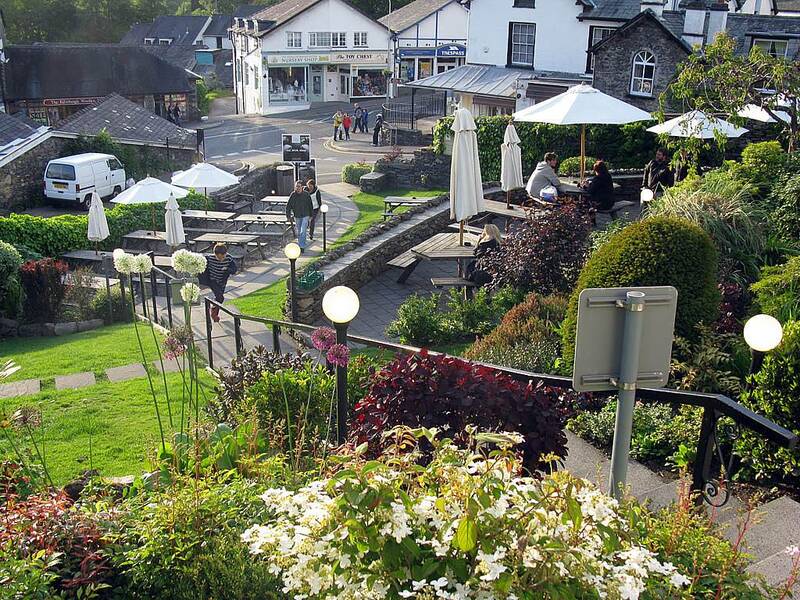 Views from The angel Inn pub. 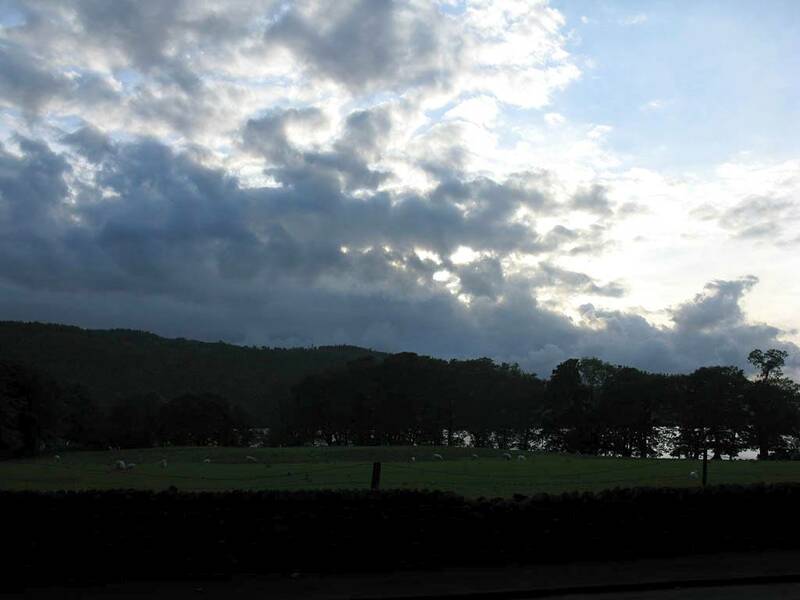 The sun goes down on the last evening in Bowness. It was a grey start. 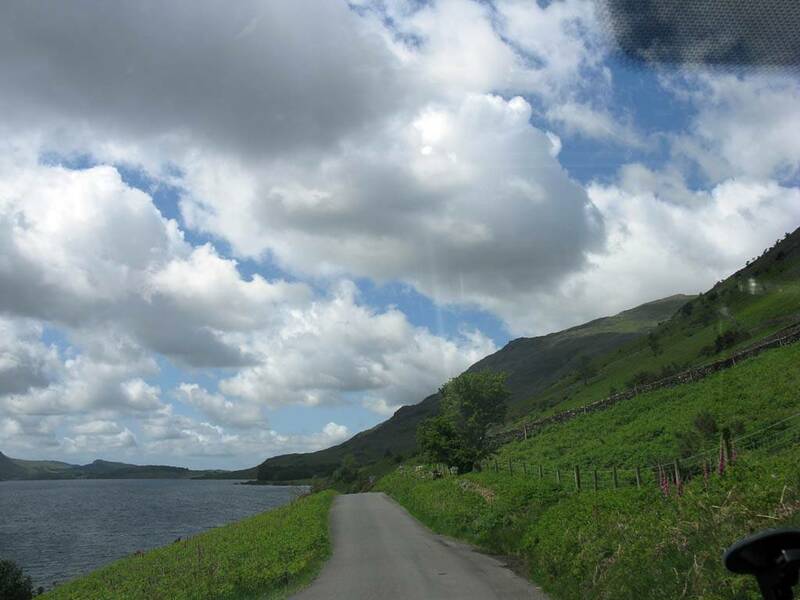 But we checked out by 10AM and hit the road and headed away to brighter skies further inland. 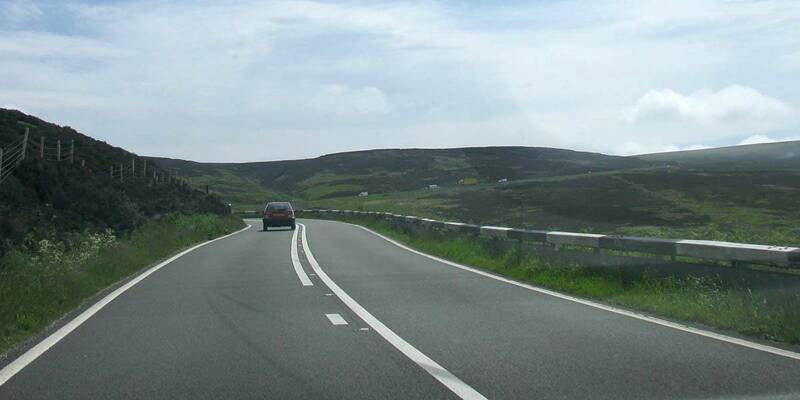 We came off the M6 at J30 and took the M61 southwards. 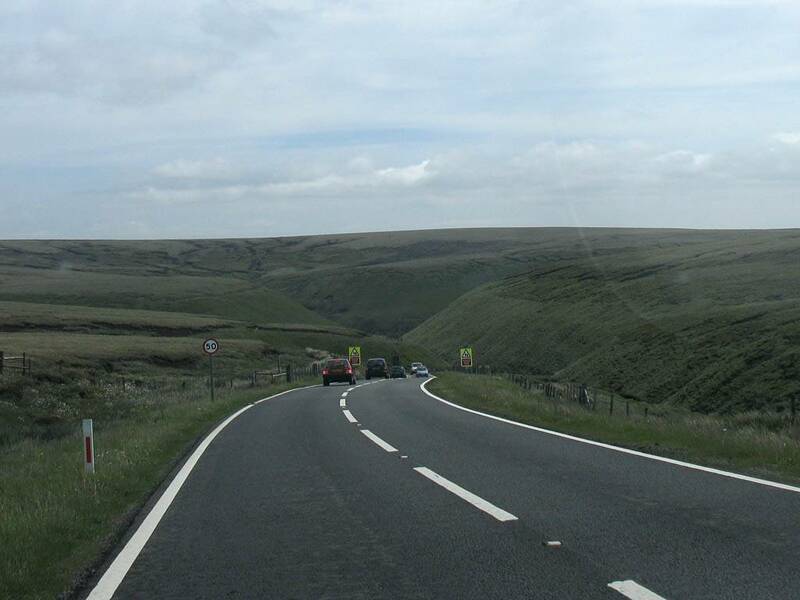 Then we skirted round Manchester to the M67 and the A57 to Glossop. 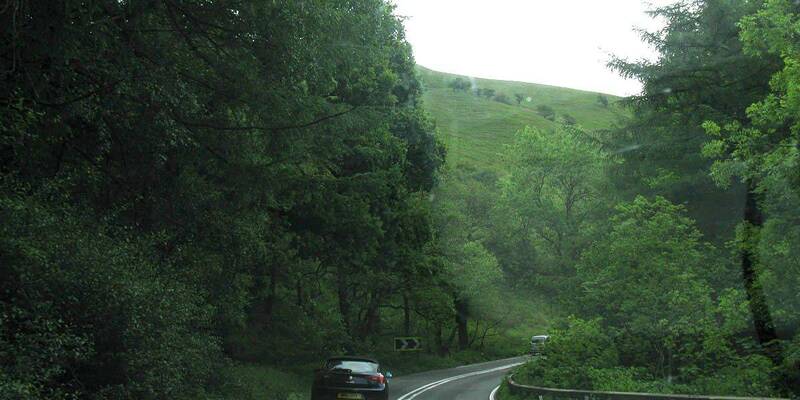 After Glossop we hit the Snake Pass. 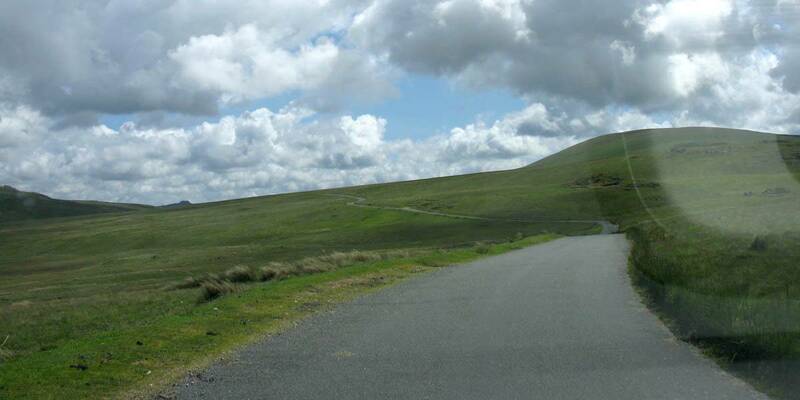 After a pleasant run over the top of the moors (so gentle after the passes in the LAke District!) 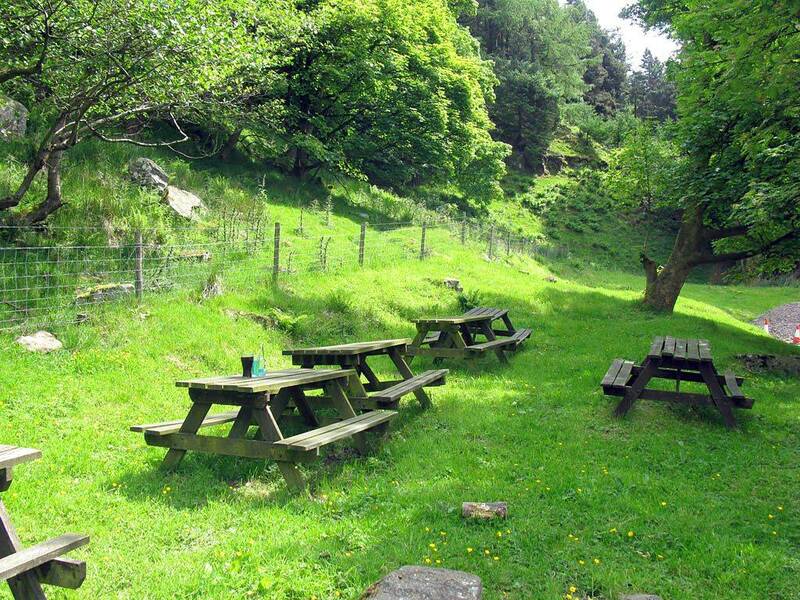 we stopped at the Snake Pass Inn for a nice lunch. Then onwards to Sheffield where I got petrol. Then from there it was 31 junctions straight down the M1 and home. 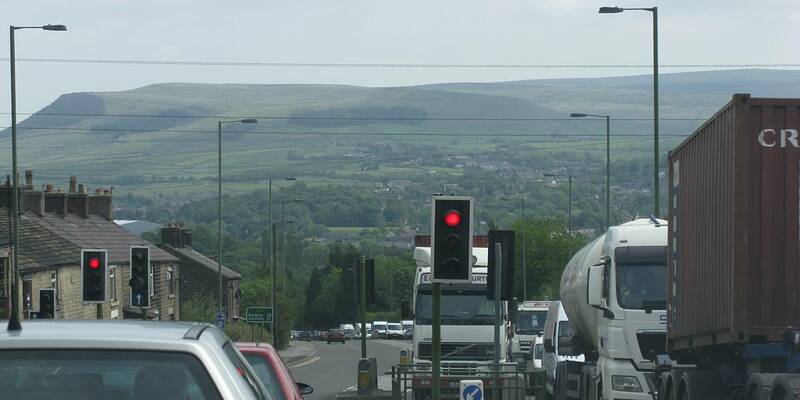 Looking ahead to the moors from a traffic light in Glossop. 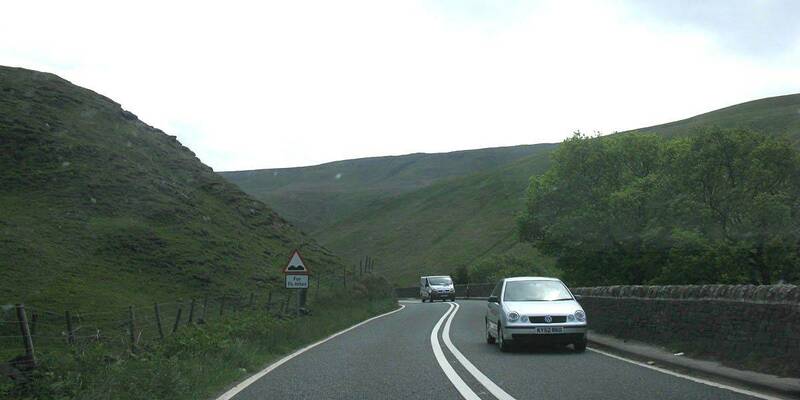 Heading up onto the Snake Pass. 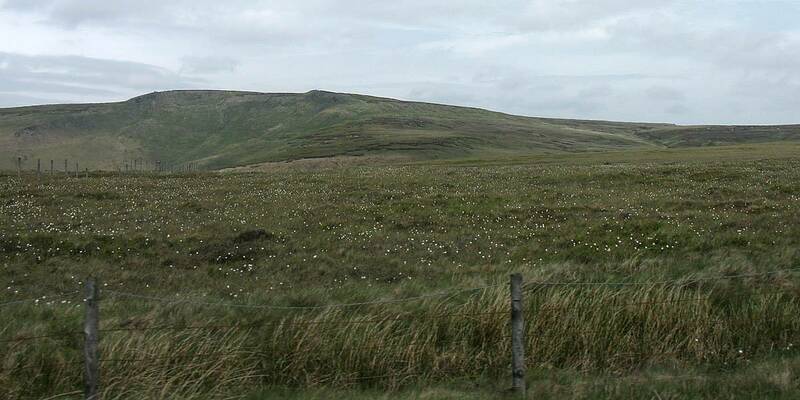 Looking across the moor to Featherbed Top. 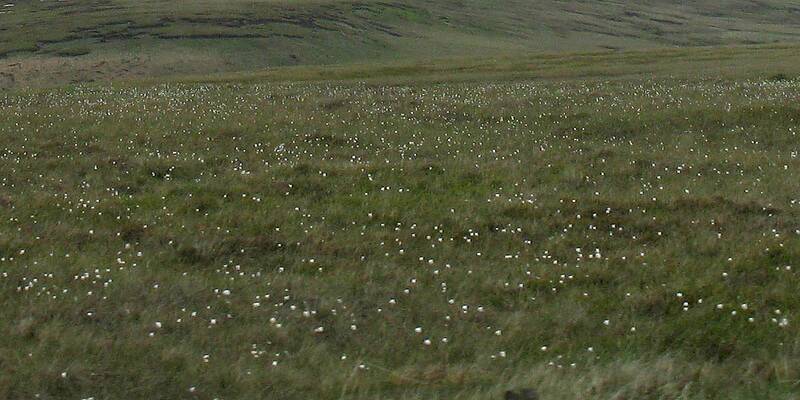 The moor is covered in bog cotton. 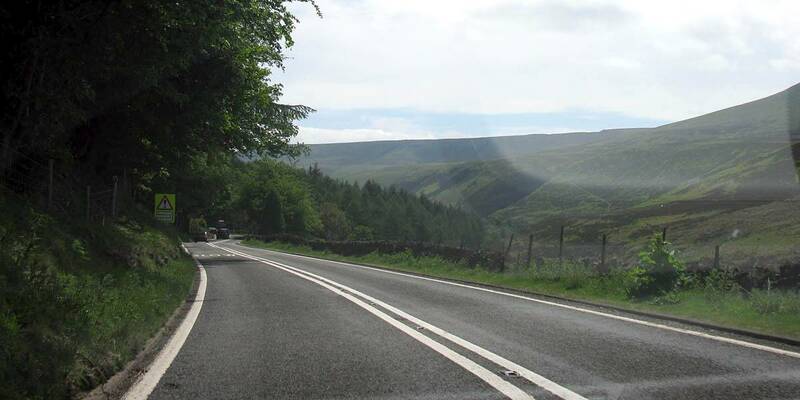 Descending from the top of the Snake Pass. 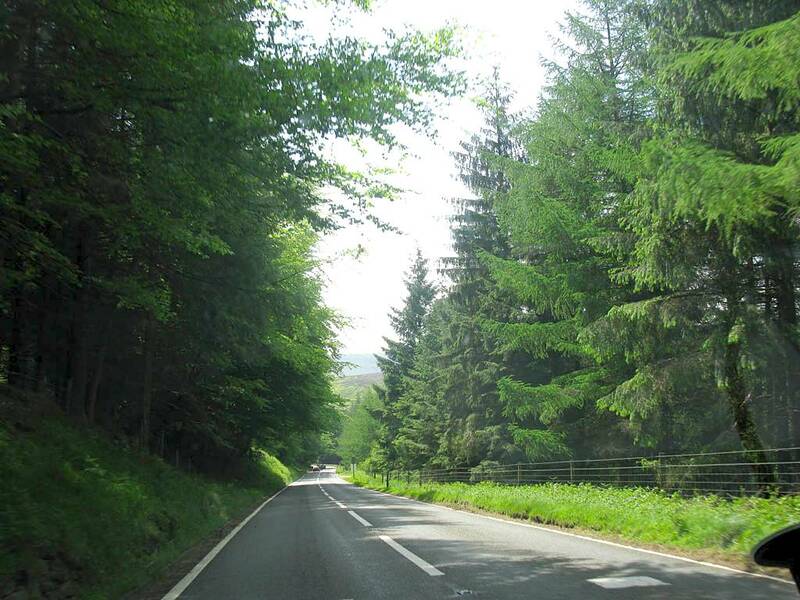 In the wooded area of Lady Clough approaching the Snake Pass Inn. 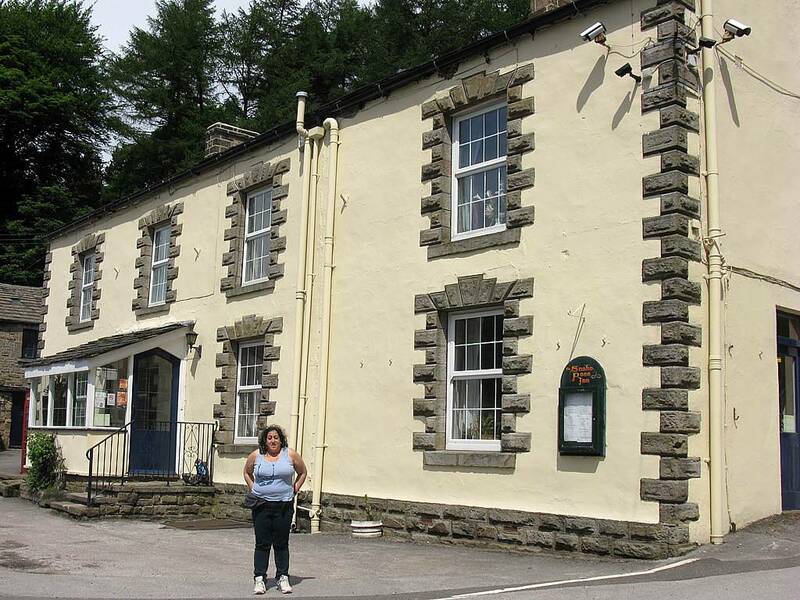 The Snake Pass Inn. 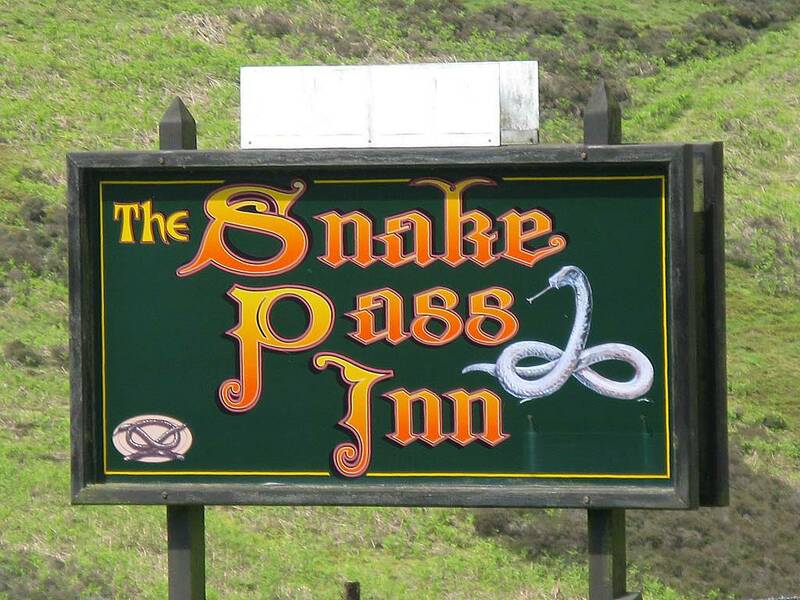 The Snake Pass Inn. Benches at the back of the pub. 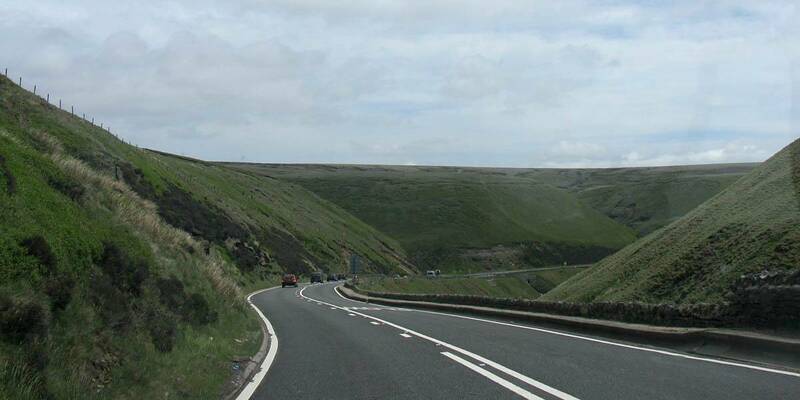 Carrying on down off the Snake Pass. 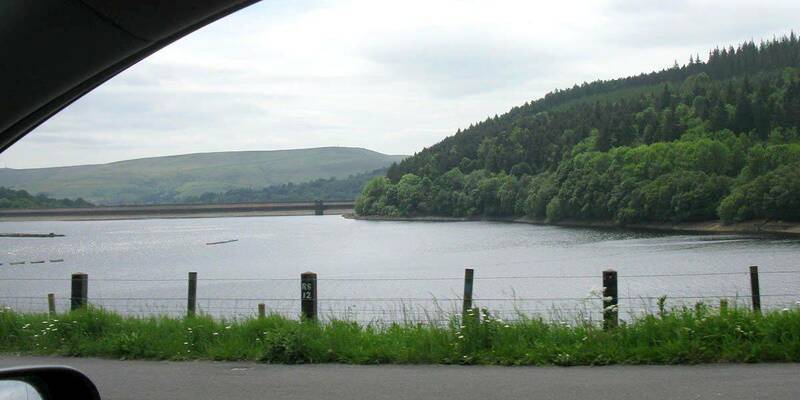 The northwestern end of the Ladybower Reservoir. 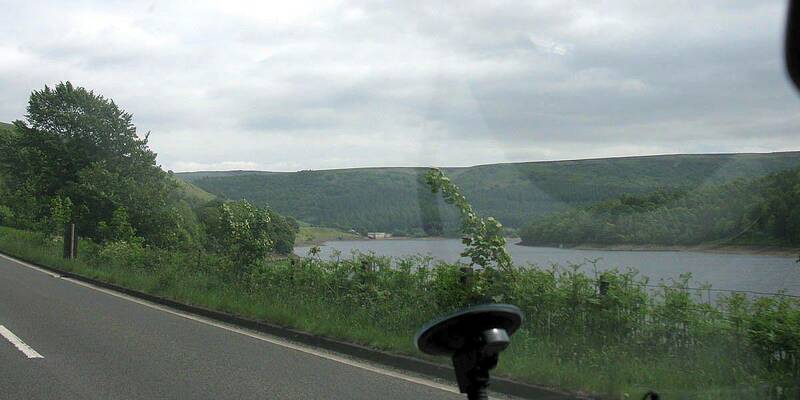 Crossing over the Ladybower Reservoir at Ashopton. 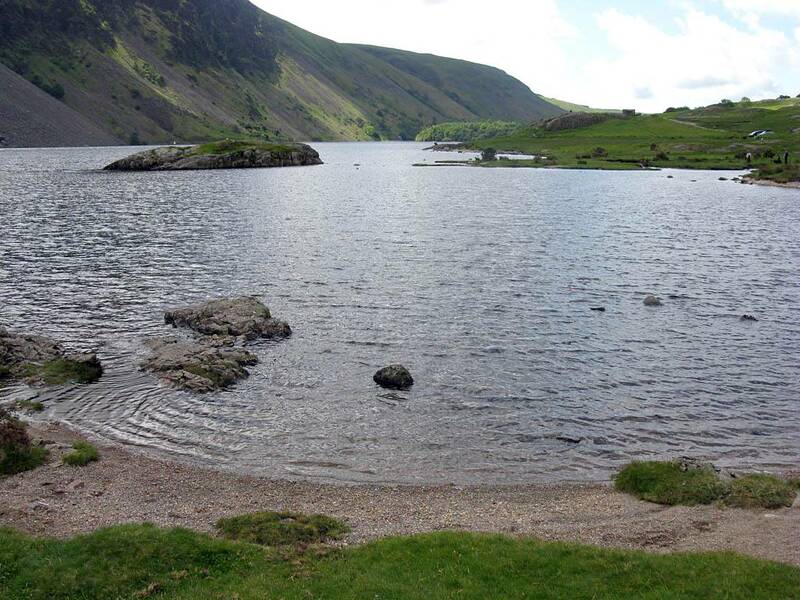 Looking to the Southern end of the reservoir. 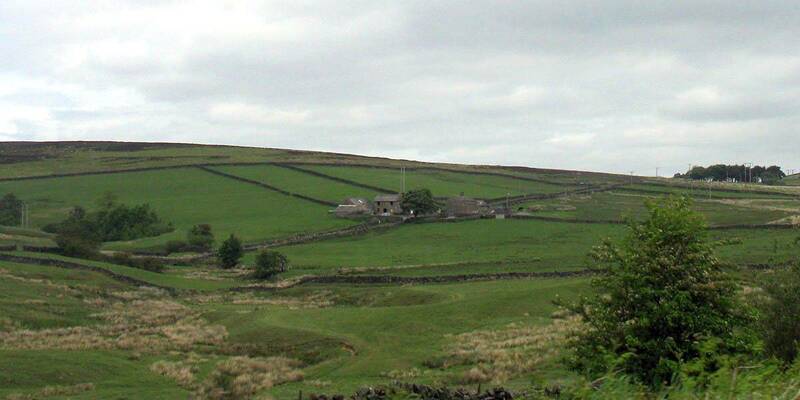 One more view as we start to descend into Sheffield. 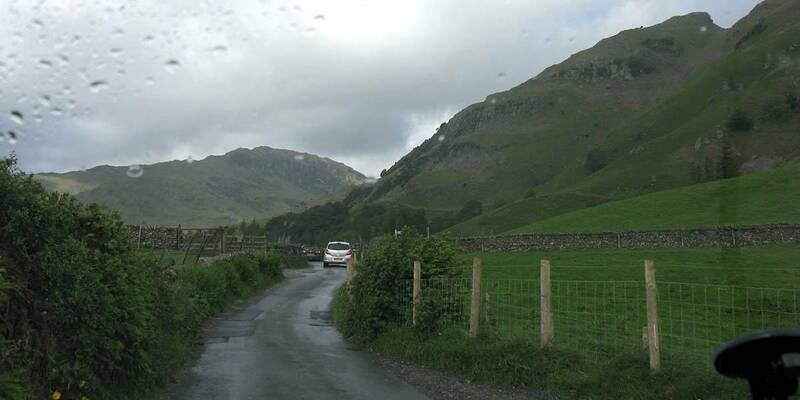 Or click here to go back to Lake District 2011 Page 4.